Amyotrophic Lateral Sclerosis (ALS), commonly referred to as Lou Gehrig’s disease, is defined as an adult-onset progressive motor neuron disease that affects both upper and lower motor neurons. This diagnosis represents the most common adult form of motor neuron disease. Scarring and degeneration of motor neurons in the lateral aspect of the cerebral cortex, brain stem, and spinal cord are distinct features of ALS. Histopathologically, ALS presents with motor neuron loss in these areas. The degeneration of motor neurons in this disease leads to paralysis of the limbs, dysphagia, dysarthria, and respiratory failure. Muscle fiber atrophy and amyotrophy are also present due to peripheral nerve changes. Figure 1. Neuromuscular changes with ALS. ALS can be divided into two types, familial and sporadic. Familial ALS (FALS) accounts for approximately 10 percent of the total cases of ALS and is inherited in an autosomal dominant manner. Approximately 20-25 percent of FALS cases are caused by missense mutations on the Copper and Zinc superoxide dimutase (SOD1) gene. [2, 6] Approximately five percent of FALS cases are due to mutations in sarcoma genes, like the FUS gene. The remaining 90 percent of ALS cases are termed sporadic ALS (SALS). The incidence of ALS is approximately two individuals per 100,000 and approximately 5,000 individuals each year are diagnosed with this disease in the United States. There are approximately 25,000 individuals in the United States diagnosed with this disease. It is estimated that, in the United States, 15 new cases are diagnosed each day. The onset of disease for the majority of individuals with ALS occurs in the fourth and fifth decades of life. This disease more commonly affects men, however a bulbar onset of the disease is more common in women. After the age of 65, the difference in incidence between males and females decreases. The estimated life expectancy following the onset of this progressive, neurodegenerative disease is approximately three years after the onset of symptoms; however, this is variable between individuals. A typical cause of death in individuals with ALS is failure of the respiratory system. A systematic review of the literature has shown a median survival timeframe of 20-48 months in most persons with ALS from the onset of the disease. In a small percentage of individuals, survival may be extended for decades after disease onset. This is consistent with the evidence that states that survival of 10 years or greater can be expected in 5-10% of the ALS population. Typically, a longer course of the disease is associated with earlier onset (less than 50 years old). The majority of ALS cases are diagnosed by a neurologist based on clinical presentation and electromyography (EMG). The World Federation of Neurology El Escorial criteria for diagnosing ALS were developed in the 1990s, and are the standard of care for diagnosing ALS. [3,9] When pathological evidence is not present, ALS diagnosis is classified as clinically definite, clinically probable, clinically probable with laboratory support, and clinically possible. The revised version of the El Escorial Criteria for the Diagnosis of ALS removed the clinically suspected category. In addition to the classification of sporadic and familial ALS, there are four general forms of ALS that present with different clusters of symptoms: pseudobulbar palsy, progressive bulbar palsy, primary lateral sclerosis, and progressive spinal muscular atrophy. Pseudobulbar palsy results from damage to UMNs in the corticobulbar tract, and patients may experience difficulty speaking, chewing, and swallowing, and they may demonstrate emotional lability, emotional outbursts, and inappropriate laughing or crying. Progressive bulbar palsy occurs when the nuclei of the cranial nerves are involved. The patient may experience difficulty swallowing and chewing due to progressive weakness of these muscles, dysarthria, weakness of facial musculature, respiratory weakness, and pseudobulbar affect. Primary lateral sclerosis is primarily a syndrome of UMN signs, as there is loss of neurons in the corticospinal tract. [13, 3] The patient will experience hyperactive tendon reflexes and spasticity resulting in difficulty with movement, but there will be no muscle atrophy. Primary lateral sclerosis is a rare form of ALS. In progressive spinal muscular atrophy, the patient presents with LMN signs due to loss of motor neurons in the anterior horn of the spinal cord. [13, 3] The progressive weakness, muscle atrophy, and fasciculations often begin in the cervical region. The patient may present with no clinical signs of UMN lesion, although post-mortem evaluation is likely to locate damage to both the UMNs and LMNs. Other rare forms of ALS with possible genetic loci include ALS with frontotemporal dementia (ALS-FTD) and ALS-FTD with Parkinson’s Disease (ALS-FTDP). Evidence demonstrates controversial data behind the direct causes and risk factors associated with the development of amyotrophic lateral sclerosis. The exact causes behind the most common form of amyotrophic lateral sclerosis, sporadic ALS, continue to be unknown despite countless epidemiological and case-controlled studies. Although there are no definitive genetic or environmental risks factors for the development of sporadic ALS, there have been multiple concepts analyzed and studied to support various environmental factors that may increase one’s risk for this variation of ALS. On the contrary, familial ALS has a definitive genetic component, yet it can be difficult to specifically identify since many mutations of the SOD1 gene can develop and ultimately lead to ALS. All the evidence must be interpreted carefully, as many of the studies analyzing the risks associated with the onset of ALS have been small case-controlled or cohort studies with no randomized controlled trials found to date on the topic. Of all the possible risk factors contributing to the development of sporadic ALS, smoking is the only factor that has been deemed a probable component. Evidence suggests that the exposure to formaldehyde in cigarettes can lead to oxidative stress and lipid peroxidation. Specifically, paraoxonases (PON's) which are esterase enzymes help to prevent peroxidation through their antioxidant properties and can be inhibited through cigarette smoking and prolonged formaldehyde exposure. [17,19] Consequently, various deficits in PON functioning have been found to be associated with ALS. [17,19] Environmental toxins have been found to act as an excitotoxin to the body’s nervous system. Exposure to pesticides and herbicides 20 years prior to the onset of sporadic ALS, has been associated with possible increased risk for the development of the disease. Debrisoquine 4-hydroxylase is a cytochrome P450 monoxygenase responsible for the metabolism of pesticides in the human body. Debrisoquine 4-hydroxylase can be affected by variability in the CYP2D6 gene, which has been illustrated to be increased in patients with ALS, resulting in poor metabolism of pesticides in these patients. Certain areas of the world have shown higher incidence and prevalence of ALS, most notably Guam, where studies have demonstrated that prevalence was nearly 50 times higher than anywhere else in the world around the time of World War II. Additionally, military personal working closely together have demonstrated higher risk for development of ALS. Head injury either 10 years prior to the onset of ALS or multiple occurrences of head trauma have illustrated increased risk for development of ALS. Although the evidence is poor, studies have demonstrated that patients with human immunodeficiency virus (HIV) have an increased risk for motor neuron disease, however these findings are controversial and never been entirely proven true. Although rare, cases of ALS following mild electrical injury have been reported in the literature, yet the mechanism of onset is unknown. The susceptibility of first-degree relatives to various other diseases have been found in relation to ALS. [13, 27] For example, dementia occurs more often in first-degree relatives of patients with ALS compared to controls, and Parkinsonism has been found to be a common occurrence in families with individuals with ALS. Due to greater than 90 mutations in the SOD1 gene, pinpointing direct genetic correlations in families has been a difficult task and continues to be an area widely researched in ALS. ALS initially presents with subtle, often missed conditions that include muscle cramps, muscle twitches, stiffness and weakness. The symptoms most frequently present in the distal arms or legs in the early stages of the disease and eventually spread. However, symptoms can also begin in the bulbar region. ALS affects both upper and lower motor neurons, with lower motor neuron symptoms generally present at the beginning of the disease. As symptoms progress in the arms and legs, muscle atrophy, fasciculations and hyporeflexia may eventually manifest themselves. Bulbar symptoms include facial weakness, dysarthria, poor palatal elevation, weak tongue pulsions, tongue atrophy, sialorrhea and fasciculations. Patients affected with ALS may present with cognitive dysfunction similar to frontotemporal dementia. These symptoms include impairments of attention, working memory, verbal fluency, frontal executive function and emotional lability. Other potential upper motor neuron symptoms include spasticity, clonus, vertical spread reflexes, horizontal spread reflex, Hoffman’s sign and hyperreflexia. [31, 32] Rarely symptoms begin with respiratory dysfunction, including shortness of breath, orthopnea, morning headaches and drowsiness. Regardless of where the symptoms originate, they will eventually progress to the other parts of the body. Most people with ALS eventually die from respiratory failure due to weakness of respiratory musculature. Length of survival has been correlated with area of onset and number of areas initially affected . Time to mortality has been correlated with area of initial presentation . The average life expectancy of a patient diagnosed with ALS is two to four years, with few patients living longer than 5 years . As such, the symptoms rapidly progress. The life expectancy does vary with initial area of onset. On average, initial lower extremity presentation survived 32 months with a 21% survival rate greater than 5 years, upper extremity survived 33 months and 18% at 5 years, bulbar symptoms survived 26 months and 16% at 5 years, and patients who initially presented with two areas affected simultaneously survived an average of 18 months post diagnosis with 0% survival greater than 5 years . The shorter duration between initial site of presentation and presentation of symptoms in a second site also correlates with decreased time to mortality. The revised El Escorial criteria are the primary method for diagnosing ALS. ALS is a diagnosis of exclusion. A number of potential differential diagnoses must be ruled out prior to diagnoses of ALS. The most common are multifocal motor neuropathy with conduction block and cervical spodylotic myelopathy. Other potential differential diagnosis are displayed in Table 1. Four progressive categories were created in the initial El Escorial criteria. Released in 1994, the criteria were revised in 1998 to recognize electrodiagnostic testing and added the category clinically probable ALS as displayed in figure 2. They were further updated in 2008 with the Awaji-Shima algorithm. This allowed needle EMG signs of denervation to count as a LMN sign and fasiculations to be considered equivalent to fibrillation potentials and positive sharp waves. [33, 35] This has allowed for more definitive early diagnosis of ALS, however the revised El Escorial criteria is still the most commonly diagnostic guidelines. The primary method for rating function and tracking progression of ALS is the revised ALS functional rating scale (ALSFRS-R). This is a self-report scale of function that has the patient rate 12 items on a 0-4 scale in the categories of fine motor function, gross motor, bulbar and respiratory, with a higher score indicating better function. Low initial scores on the ALSFRS-R at time of diagnosis have also been implicated in shorter time to mortality. The primary pathogenesis of ALS is widely unknown and controversial. Topics that have been thought to be a factor in ALS pathogenesis are discussed in the following section and include the SOD1 gene, mitochondrial dysfunction, apoptosis, the ubiquitin-proteasome system, glutamate excitotoxicity, and oxidative stress. The term superoxide dismutases (SOD) is used to describe a group of antioxidant enzymes that metabolize superoxide free radicals into hydrogen peroxide to help prevent the formation of reactive oxygen species. The copper/zinc SOD (SOD1) is one of the three SOD enzymes. The SOD1 gene, located on chromosome 21, encodes the cystolic copper-zinc superoxide dismutase isoform (SOD1). SOD1 is an ubiquitously, meaning widespread throughout the body, expressed protein made up of 153 amino acids that is primarily located in the cellular cytoplasm. In addition to its location in the cytoplasm, this homodimeric enzyme is also found in the intermembrane space of the mitochondria. The primary function of SOD1 is to convert superoxide free radicals located in the cell, which are toxic waste byproducts of oxidative phosphorylation in the mitochondria, to hydrogen peroxide. A cyclical process of reduction and oxidation, termed dismutation, of copper is what enables SOD1 to convert these superoxide anions to hydrogen peroxide. This process is essential in minimizing the production of reactive oxygen species (ROS). This catalytic function makes this protein a cellular antioxidant. Figure 3. Normal function of SOD1. It is approximated that 20-25% of FALS cases are caused by mutations in SOD1. A cohort study of 124 individuals with FALS demonstrated that 16.9% had SOD1 gene mutations. Currently, 125 SOD1 mutations have been identified of which 114 are shown to be related to disease. The majority of SOD1 mutations associated with ALS result in a single amino acid substitution but in a few instances the mutation results in deletion or truncation of the amino acid. The most prominent SOD1 mutation in North America, which is responsible for an estimated 50% of all cases, is the alanine-to-valine substitution at SOD1’s position 4. This mutation presents aggressively with an average survival of one year following onset of disease. Mutations in the SOD1 gene have been reported to present the mutant protein with a toxic gain of function. When disease is triggered by a singular abnormal protein the resulting disease is thought to be due to toxic influence of this abnormal protein that is caused by the genetic mutation. On the other hand, another reported result of SOD1 mutation is a decrease in dismutation activity, which is the process of neutralizing the superoxide anions created with oxidative phosphorylation. The result of this reduced dismutation activity is a build-up of superoxide free radicals. This oxidative damage is thought to influence nerve cell damage in ALS. Mutations of the SOD1 gene lead to a process of toxic misfolding and aggregration of SOD1, which may cause an increased incidence of reactive oxygen species (ROS). Once a gene for a neurodegenerative disease has been identified, transgenic animal models can be developed. Mice and rats are two commonly used animal models in the study of ALS. The advantage of using animal models is the potential to help determine disease progression. The use of these transgenic models with mutations of SOD1 have been important for helping to gain an understanding of the biology of motor neurons and the process of neurodegeneration. The murine model also allows for testing of various treatments, including genetic and pharmacological treatments, before they are utilized in human trials. Caution is advised in the interpretation of animal models because higher levels of mutant proteins are needed to induce a similar pathologic phenotype as compared to humans. The pathology and associated clinical symptoms of SOD1-FALS are similar to that of SALS and therefore the use of transgenic animal models expressing a mutated SOD1 may provide insight to the pathogenesis of both types of ALS. There are numerous transgenic lines, carrying mutations at different positions in SOD1, which have been developed and used in research. The age of onset for disease depends mainly on the transgene copy number. However, the disease severity depends mainly on the mutation type. Mice that express a variety of SOD1 mutations associated with ALS have demonstrated a resultant fatal paralysis that resembles human patients with ALS, and therefore this animal model allows for a mechanism to define the disease process of FALS. In addition, over-expression of mutant SOD1 in mice leads to progressive skeletal muscle weakness and muscular atrophy, which are typical symptoms of ALS, which further demonstrates the beneficial effect of using this transgenic mouse model in the study of ALS. The most commonly studied mouse model of ALS is the SOD1-G93A, in which the transgenic mice carry approximately 20 SOD1 mutations. A benefit of this SOD1 transgenic model is the relatively narrow variation in lifespan as compared with other transgenic models. Early studies of the effect of SOD1 mutations have demonstrated the impact of over-expression on motor neuron disease. High levels of human SOD1 with a substitution at the glycine to alanine position 93 (G93A) leads to no impact on the activity of SOD1. This mutation did result in paralysis in at least one limb due to motor neuron loss in the spinal cord followed by death at 5-6 months of age. It is known that mutations in SOD1 are related to the pathogenesis of ALS, and in order to determine if an over-expression of human wild-type SOD1 will change the impact of the mutation research has utilized human wild-type SOD1 in mutated mice. The use of human wild-type SOD1 is used to better represent the human disease process. Gurney et al compared the effects of two transgenic lines either over-expressing a mutant form of human SOD1 (G93A) or human wild-type SOD1. Mice over-expressing human mutant SOD1 developed characteristics indicative of motor neuron disease, whereas mice expressing levels of human wild-type SOD1 at equal or greater amounts of mutant human SOD1, did not develop these characteristics of motor neuron disease. Numerous studies have followed-up this study to further determine the effects of human wild-type SOD1 on animal models with an ALS-associated SOD1 mutation. Deng et al looked at the effect of over-expression of human wild-type SOD1 in three mouse lines, each expressing a different SOD1 mutation associated with ALS (G93A, A4V, L126Z). In the SOD1(G93A) transgenic model over-expression of human wild-type SOD1 led to an accelerated development of the ALS-like phenotype and a decrease in lifespan. Similarly, in double transgenic mice over-expressing human wild-type SOD1 and mutant SOD1 (L126Z) a resultant earlier disease onset and reduced lifespan was demonstrated as compared to a single transgenic model only over-expressing mutant SOD1 (L126Z). In single transgenic model of SOD1 (A4V) no disease developed after two years, which may be due to the decreased expression of this mutation. To test the effect of human wild-type SOD1, a double transgenic model was developed over-expressing both SOD1 (A4V) and human wild-type SOD1. The presence of the over-expression of human wild-type SOD1 led to a conversion of an unaffected phenotype to the development of an ALS-like presentation with resultant death. A second A4Vmodel (A4VL) was used that had a reduced expression level (20% as compared with A4V) and was crossed with the same over-expression of human wild-type SOD1 as the previous line. Interestingly, these double transgenic mice did not develop the ALS-like phenotype during their lifespan. Therefore, it is suggested that a threshold level of mutant SOD1 is needed to prompt the development of ALS-like presentation. Deng et al also demonstrated that in the presence of mutant SOD1, human wild-type SOD1 is converted from its typical soluble form to an aggregated and detergent-insoluble toxic form, which may lead to the disease exacerbation or conversion to an ALS-like phenotype. These results indicate that over-expression of human wild-type SOD1 may play a role in pathogenesis of ALS, in addition to the mutant forms of SOD1. Opposing findings were seen in another study looking at the effect of over-expression of human wild-type SOD1 in a mouse model of ALS with mutated SOD1(G86R). SOD1(G86R) is the murine equivalent of the of the human SOD1(G85R) mutation. In double transgenic mice over-expressing both human wild-type SOD1 and a mouse SOD1 (G86R) mutation, a lack of effect was seen for disease exacerbation, phenotype, and survival. In addition, the human wild-type SOD1 did not demonstrate a conversion to an aggregated or misfolded form. The authors report that a direct interaction between mutant and wild-type SOD1 is needed in order to exacerbate the disease process, and that the over-expression of human wild-type SOD1 in an SOD1 (G86R) mouse model demonstrated no effect on the disease due to a lack of interaction between the two SOD1 species. The large variation in the lifespan of this line of mice may have influenced the results. There may also be a unique property in this line of mice that inhibits or limits its ability to interact with the wild-type SOD1. The results of this research indicate that is it not clear whether over-expressing human wild-type SOD1 in patients with ALS mutations will result in a change in the pathogensis of the disease. There is controversy regarding whether mutant SOD1 presents a toxic gain-of-function or a decrease in activity, and therefore knockout models of SOD1 have been used to determine the effects of its deletion. The use of this knockout model can help determine the influence of SOD1 on motor neuron viability. This model may utilize either a heterozygous (SOD1+/-) or a homozygous (SOD1-/-) model. The SOD1+/- yields a 50 percent reduction in SOD1 protein and its activity, whereas the SOD1-/- yields a complete loss of the protein and a minimal activity level. Both the heterozygous and homozygous models demonstrate normal body weights and development into adulthood. No behavioral signs of motor neuron dysfunction were seen at 6 months of age in wild-type SOD1 or both the heterozygous and homozygous models. Among all three models, similar stride lengths and running wheel performance were seen, indicating consistent motor functioning. Limb tremor, which is a characteristic of the onset of paralysis in transgenic mouse models of FALS, was not seen in the wild-type or either the heterozygous or homozygous models. This data indicates that SOD1 is not necessary for normal development or survival into adulthood in these mouse models. In addition, at 4 months of age, no spinal cord morphological changes were seen in the heterozygous and homozygous models. Although it appears that during homeostatic conditions SOD1 is not required for survival of motor neurons, it appears to have a critical role in promoting survival after neuronal injury. The amount of motor neuron survival following a nerve injury is related to the level of SOD1 activity. Contradictory findings were seen in another study looking at the effects of a homozygous deletion of SOD1 (SOD1-/-) in a mouse model. As compared to wild-type mice, the SOD1-/- mice were 17-20% smaller in terms of body mass. The transgenic mice also demonstrated a significantly decreased amount of hind limb muscle mass at as early as 3-4 months of age. This decrease in muscle mass becomes exaggerated with age and an approximate 50% reduction in muscle mass was seen in the knockout mice at 20 months of age as compared with the age-matched wild-type mice. A progressive increase of impairment for Rota-rod performance was seen in the knockout model mice with aging. Muller et al also demonstrated visible individual digit tremors in a small number of the mice around 13 months of age. However, by 20 months of age, apparent tremors were demonstrated in the entire hind limb for approximately 70% of the SOD1-/- mice which was not demonstrated in the wild-type mice. Reaume et al did not demonstrate the presence of tremors in their 6 month old knockout model mice but this may have been an insufficient time to demonstrate such changes since tremors were not apparent until at least 13 months of age in the study by Muller et al. A concern with the SOD1 knockout model is an increase in oxidative stress since SOD1 functions as an antioxidant. To determine the impact of oxidative stress, levels of lipid peroxidation and protein carbonyl content were observed in the brain. These cell components represent the end-products of oxidative damage, and therefore are used as markers of oxidative damage. As compared to wild-type SOD1, both the homologous and heterozygous models showed no significant differences in these two cellular components. This indicates that a heterozygous or homozygous deletion of SOD1 did not lead to increased oxidative damage. In addition, no changes in mitochondrial form SOD (MnSOD) were seen in either model, indicating that the lack of oxidative damage was not due to a compensation of this SOD isoform. Muller et al demonstrated contradictory findings related to oxidative damage. As compared with the wild-type mice, SOD1-/- mice demonstrated elevated levels of lipid peroxidation, protein carbonyls, and DNA oxidative damage (8-oxo-dG) in the muscle. Elevated levels of these components indicates the presence of oxidative damage. Muller et al analyzed these markers at 5 and 20 months of age and Reaume et al only reported results of 120-130 day old mice which may account for the difference in results. The results of these studies indicate that there is contradictory evidence related to the effect of a homozygous deletion of SOD1 in mice in relation to development and oxidative damage. It appears that deletion of SOD1 in mice does not solely cause ALS and other factors impact the overall disease process. The more recently developed transgenic rat models over-expressing mutant SOD1 provide an advantage over mouse models due to their size. Because of the size limitations in mouse models, there are several tests and treatments that are unable to be performed. Rat models allow for CSF analysis, which includes the ability to look at DNA/RNA, as well as manipulation of neurotransmitters such as glutamine and glutamate. Rats are also able to tolerate immunosuppressive therapy, which allows for stem cell research. In addition to the ability to perform and monitor neuronal stem cell therapy, the larger size can facilitate testing the effects of implanted pumps for intrathecal drug delivery. Transgenic rats also have been proven to demonstrate neurologic symptoms similar to human or mouse models of ALS, demonstrating the benefit of rat models. The SOD1 mutation model in rats is useful because a number of different SOD1 mutations can be isolated and observed or experimented on. SOD1 mutations G93A and H96R have been shown in the rat model to lead to the characteristic phenotype and symptom presentation of human ALS. Nagai et al demonstrated that over-expression of mutant SOD1 were accompanied by death of motor neurons, astrogliosis, and microgliosis. Rats with the G93A mutation had symptoms that progressed faster than the rats demonstrating H96R. They also demonstrated motoneuron degeneration in the brainstem with proliferation of astroglia, with the G93A mutation having increased amount of vacuols in the axons and dendrites. The likelihood of developing motor neuron pathology appears to be proportional to the amount of mutated SOD1 protein. A study by Howland et al created a transgenic line of rats over-expressing an SOD1 (G93A) mutation with approximately 8-times the endogenous amount of SOD1. This over-expression of SOD1 (G93A) was an adequate amount to induce motor neuron disease similar to ALS by 3-4 months of age in the transgenic rats. By the end-stage of disease, the level of accumulation of mutant SOD1 was approximately 16-times the exogenous amount, doubling in expression as compared with the young rats that were pre-symptomatic. Motor neuron disease onset was determined by the initial observation of abnormal gait or hindlimb weakness. End-stage disease was marked by the failure of the righting reflex which coincided with bilateral hindlimb paralysis and forelimb paralysis in at least one limb. The mean age of motor neuron disease onset was 115 days with the presence of end-stage disease in an average of 11 days following onset. This indicates a rapid progression of the disease. Muscle pathology in the end-stage transgenic rats was demonstrated by angulated, atrophic muscle fibers that were mainly in a clustered appearance as compared to normal appearing muscle in wild-type littermates. Electrophysiologic recordings from the end-stage transgenic mice rats with hindlimb paralysis demonstrated decreased compound motor action potentials (CMAPs) in the intrinsic muscles of the foot, which indicates a loss of motor neurons. The use of needle electromyography (EMG) in the leg muscles revealed fibrillation potentials and positive shape waves in the end-stage transgenic rats. These results are suggestive of denervation in this transgenic line. The lumbar spinal cord of the end-stage transgenic rats demonstrated gliosis with a total loss of ventral alpha-motor neurons as compared with age-matched wild-type rats. Overall, an over-expression of mutant SOD1 in rats leads to the development of an ALS-like motor neuron disease. Interestingly, other transgenic lines with a lower amount of over-expression of SOD1 (G93A) (0.1-6 times increase) were asymptomatic with no signs of motor neuron disease by one year of age. It appears that the amount of over-expression of mutant SOD1 influences the development of motor neuron disease. Evidence has also been demonstrated that mutant ALS rats have impaired blood-brain barrier. Increased levels of IgG may serve to activate the inflammatory protein cascade characteristic of ALS. Hemosiderin has been demonstrated in the ventral horn of transgenic rats, which could indicate hypoxia induced damage. Rats over-expressing wild-type SOD1 have been researched as a model of ALS. While wild-type rats are frequently used in the literature as a control group, transgenic rats with an overexpression of SOD1 have also been used in research. The rats demonstrate a similar phenotypical appearance in the cerebral vasculature as compared to wild-type control littermates. In response to transient global ischemia in the cerebrum, transgenic rats over-expressing wild-type SOD1 demonstrate delayed neurodegeneration and prevention of cell death especially in the hippocampus, cortex, striatum, cerebellum and thalamus.They also demonstrated significantly less DNA fragmentation, with significantly less evidence of superoxide radicals in hippocampal pyramidal cells. Much of the cell death after ischemia is thought to be the result of a combination of apoptosis and necrosis, with decreased amounts of apoptosis and necrosis in the group of rats over-expressing SOD1 as opposed to the control littermates. This is important due to the selective neuronal damage seen in ALS. Many researchers believe there is a link between ALS and mutations in SOD1 and a link between oxidative stress and ALS. [8,42,101] Normally, SOD1 acts to decrease the amount of oxidative damage caused by free radicals. Oxidative damage in cells has been linked to apoptosis. The theory that mutations in SOD1 may be the cause of neuronal cell death in ALS supported by the fact that rats overexpressing wild-type SOD1 demonstrated neuroprotective effects to increased levels of superoxide and decreased levels of cell death in comparison to a control littermates with normal levels of SOD1. The mitochondria are responsible for energy production through oxidative phosphorylation and play a role in cell apoptosis. Superoxide is produced in the mitochondria as a normal byproduct of oxidative phosphorylation. SOD1 is the protein responsible for the removal of superoxide through dismutation, and mutations in the gene that encodes SOD1 in some cases of FALS lead to an increase in the presence of this free radical in the body which contributes to nerve cell degeneration. It is generally accepted that SOD1 is partially located within the mitochondria, though the exact localization of SOD1 in the mitochondria is unknown. [10, 61, 62] Exposure to SOD1 also has a negative impact on the levels of numerous mitochondrial proteins in the cell, which leads to a decrease in overall protein import in spinal cord mitochondria. [63, 64] There is also evidence that the degradation of damaged proteins is negatively affected in ALS and other neurodegenerative diseases. It is important to remember, however, that there are many possible mutations of the SOD1 gene associated with ALS, and not all forms of the SOD1 gene result in the same patterns of mitochondrial dysfunction.. The strongest evidence for apoptosis in the pathogenesis of motor neuron degeneration in ALS is the variation and balance between the Bcl-2 family of oncoproteins in addition to the increased expression of caspases. The intrinsic pathway of cellular apoptosis is regulated by the Bcl-2 family proteins. The group of Bcl-2 family of proteins includes both pro-apoptotic proteins, Bax and Bak, which result in release of cytochrome C and other pro-apoptotic effectors into the cell cytosol ultimately leading to cell death, and anti-apoptotic proteins, Bcl-XL and Bcl-2, which work to inhibit the pro-apoptotic proteins and maintain cell survival. [ 75,76] Cytochrome c release from the mitochondria into the cytosol plays an important role in the regulation of cellular apoptosis and has been shown to be released through Bax channels. Additionally, Bak and Bax have demonstrated facilitation of cytochrome c release from the mitochondria via opening of mitochondria voltage-dependent anion channels (VDAC), whereas Bcl-XL binds to the VDAC and inhibits cytochrome c release. Anti-apoptotic proteins function to promote cellular survival by blocking the pro-apoptotic proteins' function. A study by Reyes et al investigated the effects of blocking the intrinsic, or mitochondrial, pathway of apoptosis in order to determine the effect of neurodegeneration in a mouse model of FALS. The transgenic mice were generated to be deficient for Bax and Bak proteins.. Resistance to apoptosis in response to a variety of intrinsic death stimuli, including protein misfolding, ROS, or damage to DNA, is demonstrated in cells that are deficient in Bax and Bak proteins. There were two main groups in this study that both expressed the human mutant SOD1 (G93A). The difference between the groups was in the expression of Bax and Bak. The first group was the complete knockout model of both Bax and Bak (DKOCNS), which was deficient for both of these proteins, termed SOD1G93ADKOCNS. The second group of transgenic mice expressed at least one allele of both Bax and Bak (CreCNS), termed SOD1G93ACreCNS. The effect on symptoms onset, lifespan, loss of motor neurons, and motor function were explored. Results indicated that SOD1G93ADKOCNS had an approximate delay in symptom onset of 3.5 weeks as compared to the SOD1G93ACreCNS group. By the time the SOD1G93ACreCNS mice developed terminal paralysis, most of the SOD1G93ADKOCNS mice did not demonstrate weight loss or paralysis. Additionally, life span was increased by approximately one month in the SOD1G93ADKOCNS as compared to the SOD1G93ACreCNS group, a 21% increase. To further demonstrate the influence of Bax and Bak on lifespan, the two groups were compared to the third transgenic SOD1G93A model that was deficient in either Bax or Bak. These mice demonstrated increased lifespan as compared with the SOD1G93ACreCNS mice but not to the extent of SOD1G93ADKOCNS. These findings are suggestive of a gene-dosing effect. In addition to the delayed symptoms onset and increased lifespan, SOD1G93ADKOCNS mice demonstrated motor neuron preservation, continuing through the end stage of disease. It took the SOD1G93ADKOCNS mice 60 days longer (150 days as compared to 90 days) to reach the level of motor neuron loss seen in the SOD1G93ACreCNS mice. Caspase-3 activation and TUNEL staining were used to determine that increased survival of motor neurons was related to a decrease in apoptosis. On the other hand, the SOD1G93ACreCNS mice demonstrated caspase-3 activation and TUNEL staining beginning at 90 days. Spinal cord motor neurons in the SOD1G93ADKOCNS group demonstrated functional preservation by the increased amount of myelinated axons and innervated synapses as compared to the SOD1G93ACreCNS group. Motor function, measured using rotarod performance, was maintained for a significantly longer period of time in the SOD1G93ADKOCNS group as compared to the SOD1G93ACreCNS group. Overall, the intrinsic apoptotic pathway has a direct influence in the pathogenesis of FALS. It appears that SOD1(G93A) triggers neuronal cell death by activating the intrinsic apoptotic pathway. The blocking of the intrinsic apoptotic pathway through deletion of Bax and Bak proteins results in a significant preservation of motor neuron viability and motor function in addition to delayed symptom onset, delayed weight loss, and increased life span. The positive effects seen by blocking the intrinsic pathway through the deletion of Bax and Bak may lead to a possible therapeutic target for individuals with ALS. Although the evidence is controversial, tumor suppressor protein p53 may have the ability to promote apoptosis. Apoptosis related to p53 is associated with increased manifestation of the Bax gene with decreased regulation of Bcl-2 gene expression demonstrating the relationship of p53 with cellular death. [84, 85, 86] Using human post-mortem ALS tissue compared with controls, there was an increase in p53 immunoreactivity in the anterior horn of the spinal cord most notably the lumbosacral segments and motor cortex. Yet, in G93A SOD1 mice crossbred with p53-knockout mice, the absence of p-53 did not protect the mice from development of ALS. The contradictory evidence seen for the role of p53 does not illustrate the effects this protein has on the overall apoptotic pathway in ALS and further research in this area needs to be conducted to fully understand its role. The UPS is most common in FALS secondary to mutations in SOD1 which increase the occurrence of protein misfolding and aggregation. In normally functioning cells, the UPS performs protein folding, protein transport and degradation, signal transportation, and control of apoptotic pathways. The proteasome also is responsible for catabolizing misfolded proteins and preventing aggregation into insoluble complexes. The UPS works together with chaperones, like heat shock proteins, to transport, degrade, aid in the folding of proteins, and prevent proteins from interaction with inappropriate partners. The heat shock proteins are protective and can refold proteins to regain their previous functional level. However, if the misfolded proteins cannot be fixed they are escorted to ubiquitin. When proteins are tagged by ubiquitin, proteasome is then signaled to destroy the damaged protein. In ALS, a large accumulation of ubiquitinated proteins aggregate in the cell causing a decrease in intracellular clearance of damaged proteins and a possible pathogenesis for neurological diseases like ALS. Specific to ALS is the mutant protein of SOD1. Mutant SOD1 is found in motor neurons and surrounding astrocytes in patients and in transgenic mice with ALS . The genetic mutation of SOD1 promotes protein misfolding and increases the protein aggregates in the cell . The pathogenesis of SALS is largely unknown but excitotoxicity appears to have a large role in the progressive motor neuron loss in the spinal cord and cerebral cortex. Glutamate excitotoxicity is one mechanism implicated in the pathogenesis of ALS. Glutamate is the main mediator of excitatory transmission in the central nervous system (CNS). This neurotransmitter is responsible for activating the firing of motor neurons. Excitotoxicity is defined as degeneration or death of neurons caused by persistent and excessive stimulation of the glutamate receptors that results in a large amount of calcium entering the cell. The excessive influx of calcium into the cell supersedes the amount of storage space available in the mitochondria and endoplasmic reticulum. The exact mechanism of how the excessive amounts of calcium lead to cell death is unclear, but calcium ion activation of catabolic enzymes that are directly associated with cell death including proteases, phospholipases, and endonucleases are potential mechanisms. Elevated levels of glutamate at the cellular synapse can be caused by an increase in glutamate release and/or impaired uptake of glutamate. Excitatory amino acid transporters (EAATs) are responsible for controlling the extracelluar glutamate concentration in order to maintain levels that are low enough to allow for appropriate biological functioning without creating toxicity. The main transporter of glutamate in the CNS is EAAT2, which is typically found in astrocytes located in the gray matter of the spinal cord. This astroglial glutamate transporter is the main mechanism for maintaining low levels of extracellular glutamate. Decreased expression of EAAT2 leads to an increased amount of extracellular glutamate, which leads to motor neuron degeneration. Overall, when re-uptake of glutamate is decreased, an increased concentration of extracellular glutamate occurs which may allow for excessive stimulation of the glutamate receptors creating an excitotoxic environment and cell death. The effect of ALS on EAAT2 has been explored in both human and animal research. In patients with SALS, a loss of EAAT2 has been shown to be found in the motor cortex and spinal cord., A study of transgenic SOD1 (G93A) rats demonstrated decreased levels of EAAT2 in the spinal cord prior to symptom onset that increased in severity by the end stage of disease, which suggests the influence of glutamate toxicity in the pathogenesis of ALS. The down-regulation of EAAT2 expression as well as activity level in individuals with ALS implies that synaptic glutamate homeostasis influences this disease. In a study of transgenic mice with the SOD1(G93A) mutation, EAAT2 was demonstrated to be progressively decreased in the lumbar spinal cord’s ventral horn. In order to determine the effects of supplementing for the loss of EAAT2, a study by Guo et al looked at the effect crossing SOD1(G93A) mice with mice over-expressing human EAAT2. As compared to the single transgenic mice [(SOD1(G93A)], the double transgenic mice [EAAT2/SOD1(G93A)] demonstrated delayed degeneration of motor neurons and motor dysfunction but no change in lifespan. Therefore, the overall outcome of the disease was not affected by the increased expression of human EAAT2. The analysis of platelets in individuals with ALS is an additional mechanism to study impaired glutamate function. Since platelets express EAAT2, they are used as a peripheral indication of impaired glutamatergic function in the CNS. In a study of individuals with SALS, platelets demonstrate a significant decrease in glutamate uptake as compared with an age matched control group as well as a group of individuals with chronic cerebrovascular or spinal cord disease. These results suggest platelet glutamate uptake is a potential indicator of glutametergic dysfunction. Potential mechanisms relating to the impaired levels of expression of EAAT2 in individuals with ALS may include altered transcription or splicing, post-translational modifications, decreased synthesis, accelerated rates of degradation processing, and impaired transport through the plasma membrane. These mechanisms lead to impaired glutamate transport in the cell and an alteration of the CNS’s glutamate homeostasis. Therefore, proper functioning of these EAATs is important in the maintaining adequate levels of cellular glutamate. Boston-Howes et al demonstrates caspase-3 cleavage of EAAT2 leads to an inhibition of this glutamate transporter in a mouse model of ALS (SOD1-G93A). The cleavage of EAAT2 impairs its ability transport glutamate, which may lead to excitotoxicity and neuronal cell death. Overall, decrease in EAAT2 appears to contribute to the pathogenesis of ALS in addition to propogating the degeneration of motor neurons, but it is not regarded as the initiating component of this neurodegenerative disease. In addition to the research implicating glutamate excitotoxicity in the pathogenesis of ALS, the effectiveness of the drug Rizulole, a glutamate inhibitor, further substantiates this proposed mechanism. Figure 6. Excessive glutamate accumulation in the synaptic cleft. Oxidative stress is a result of an imbalance of the production of reactive oxygen species (ROS) and the ability of the body to remove the ROS or repair the damage they cause. ROS production is the result of leakage of electrons from the mitochondrial respiratory chain, resulting in incomplete reduction of molecular oxygen during oxidative phosphorylation to produce the superoxide radical O2- and hydrogen peroxide, in addition to the production of nitric oxide (NO) and superoxide by immune cells. These react to produce more potent free radicals, such as peroxynitrite (ONOO-). See Figure 3. Normally, these are deoxidized by antioxidants such as Coenzyme Q10, SOD1 and SOD2 proteins. These agents can cause conformational changes in proteins, alter cellular membrane mechanics and alter DNA and RNA. Experiments have shown increased levels of oxidative stress in the motor cortex and anterior horn cells of patients with FALS and SALS, including an increase in hemeoxygenase-1 in the anterior horn cells, malondialdehyde-modified proteins in neurons and endothelial cells and increased levels of OH in neurons. No increases in oxidative stress were noted in the cerebellum or parietal lobes, which are largely spared by ALS. The link between mutant SOD1 and ALS supports the notion that oxidative stress is linked to ALS, as mutant SOD1 has been implicated in increasing oxidative stress through multiple pathological processes. Oxidative stress has also been shown to exacerbate other pathological processes associated with ALS. This includes ROS increasing glutamate excitotoxicity by inhibiting glutamate uptake and the creation of ROS in large volumes by the mitochondria which is supposed to be reduced by SOD1 and is ultimately defective in FALS. Additional pathological processes include increased endoplasmic reticulum stress found in neurons of ALS mice, which is linked to increased levels of ROS, cytoskeletal disruption due to ROS produced by mutant SOD1 scavenging from neurofilament-light cytoskeletal components, and increased mRNA oxidation by ROS and large size motorneurons that have large metabolic demands leaving them potentially more vulnerable to ROS. Although the exact pathogenesis of ALS is unknown, immunity can play many roles in this neurodegenerative disease. Innate immunity can promote the inflammatory process and possibly cause cell death or can have a protective response in reaction to a genetic mutation or viral and/or bacterial agent. The adaptive immune system can also be altered after the initial response of the innate immune system. FALS and SALS have immune responses associated with disease progression. Studies performed in humans post-mortem have demonstrated microglia activation indicating tissue injury and activation of the innate immune system. The signal transducer and activator of transcription-3 (STAT3) is also an indicator of microglial activation. STAT3 has been found in microglial autopsy studies of humans, along with up regulation of TLR4 (toll receptor 4) which suggests chronic monocyte and macrophage activation and increased neurodegeneration. In the hmSOD1 rat transgenic model, microglial identified with CD11b (a marker of myeloid cells), were enhanced in the ventral horn, peripheral nerve, and spinal cord prior to clinical onset. Furthermore, microglial production increased throughout the disease process forming focal aggregates in the ventral horn and eventually hypertrophic astrocytes after clinical onset. Other microglial activation markers such as MHC class II and CD 68 were not found in the ventral horn until later in the disease process relative to the increase in CD11b expression. T-Cells role in the pathogenesis of ALS is unclear and has been shown to damage and protect the cell body of motor neurons depending on phenotype. In subjects with SALS, CD4+ T-helper cells have been increased along with increases in expression of HLA class II molecules on monocytes and macrophages. These results suggest the activation of the systemic immune system when compared to normal controls. However, more severe cases of ALS (ALSFRS-R score <24), patients had decreased CD4 T-cell activation when compared to normal controls. Another study by Shi et al, studied the production of IL-13 (an intracellular cytokine) by CD4 helper T-cells revealing that production of this cytokine is up regulated in patients with ALS and related to disease progression and severity. Other T-cells, such as T-suppressor or T-cytotoxic cells in the blood of ALS patients have shown no statistical difference in comparison to normal controls indicating ALS might not be associated with an autoimmune response. In the SOD1 G93A mouse model of ALS, T-cells and microglial increased in the CNS and up-regulated genes such as the neuro-protective factor IGF-1. Furthermore in this mouse model, when mice were bred onto a deficient T cell receptor background, T-cells where deficient leading to decreased activity of microglia and consequently accelerating disease progression. This is indicative of the T-cells role in a neuro-protective response in SOD1 mice. Conflicting evidence exists on the presence of certain antibodies during ALS. As shown in the cellular component chart, Zhang et al showed significantly higher ranges of serum IgM early in the disease process while IgG was found to be normal. However in the late disease process, patients showed lower values of IgG and normal values of IgM. Other studies have reported significant increases in IgG, IgM, and IgA, however this literature is dated . Circulating immune complexes (CICs) have also been studied as an immune response in patients with ALS. In patients with ALS, high molecular weight and low molecular weight CICs were observed in the patients with ALS in comparison to controls. However, six months after the initial visit, high and low molecular weight CICs decreased significantly which might have corresponded to a decrease in the ALSFRS-S function scores. Research investigation is further required in this area to determine the exact role of blood antibodies and their exact relationship to disease progression in ALS. Levels of monocyte chemoattractant protein-1 (MCP-1) have been found to be increased in the spinal cord of patients with ALS. MCP-1 is a chemokine that attaches to the receptor CCR2 on monocytes and higher levels of MCP-1 are also associated with a more severely progressing disease. Levels of MCP-1 protein and receptor CCR2 were studied to compare the levels of this chemokine in relation to macular degeneration controls. MCP-1 levels are elevated in both groups of individuals, however, CCR2 was significantly decreased in sALS patients and inversely proportional to number of monocyte and macrophage activation. This study suggests that CCR2 is decreased at all levels of ALS severity and could correlate to defective monocytes and/or macrophages in sALS. Lipopolysaccharide, a marker for systemic inflammation, is increased in patients with ALS , indicating that inflammation might play a role in the progression of ALS. Of recent interest, the toll-like signaling pathway has been suggested for the progression of inflammation eventually causing injury to the motor neuron. Chronic up-regulation of toll-receptor 2 (TRL2) and toll-receptor 4 (TRL4), which are involved in innate immunity and mediating sustained glial activity in disease, were observed in the spinal cord of patients with ALS. TLR are activated by molecules named high mobility group box 1 protein (HMGB1). HMGB1 can be released into necrotic or injured tissues and bind to the receptor for advanced glycation end products (RAGE) along with TLR2 and TLR4. In the study by Casula et al, TLR2, TLR4 and RAGE were increased in the ventral horns and white matter in patients with ALS . HMGB1 was also increased in glia cells indicating its role in the inflammation process. This study indicates that these pathways in glial cells could cause cell breakdown due to inflammation and result in motor neuron death. Genes - FUS/TLS (Fused in sarcoma/translated in liposarcoma) gene The FUS/TLS is a ubiquitously expressed protein that is most commonly found in the nucleus of the cell. This protein is involved in cellular functions including repairing DNA, transcription regulation, RNA splicing, and export to cytoplasm. In the literature this gene may be referred to as FUS. 13 mutations were found in this gene, located on chromosome 16 that were particular for FALS. R521C and R521G are common mutations of the FUS/TLS gene. Cytoplasmic retention and aggregation were found in the mutated FUS/TLS. In a cohort study of 124 individuals with FALS, 3.2% demonstrated mutations of this gene. Following the SOD1 gene abnormality, this gene is the next most commonly affected in FALS. A transgenic mouse model over-expressing a mutant human form of FUS resulted in axonal degeneration and motor neuron loss in the cerebral cortex leading to an ALS-like phenotype including progressive paralysis. A second line of transgenic mice over-expressing human wild-type FUS did not demonstrate an ALS-like phenotype and were asymptomatic. VCP (Valosin-containing protein) gene This gene, located on chromosome 9, is responsible for giving instructions for creation of the valosin-containing protein enzyme. This enzyme is responsible for numerous cell functions including cell division, membrane fusing, repairing damaged DNA, and preventing apoptosis. The valosin-containing protein is a member of the Ubiquitin-Proteasome System. This system is responsible for degrading damaged, misshapen, or excess proteins located in the cell. One of the known mutations on the VCP gene is p.R159H. The frequency of mutations on the VCP gene is demonstrated in 1-2% of individuals with FALS. Similarly, in a cohort study of 210 cases of FALS using whole exome sequencing, 1-2% of the cases of FALS had mutations of the VCP gene. SMN1 gene (Survival Motor Neuron 1) First part of the SMN gene found in humans. This part is the telomeric portion responsible for encoding full length protein. Gene found in humans located on the long arm of chromosome 5 that is responsible for making SMN protein. SMN protein is found throughout the body, but in high concentration in the spinal cord. Normally, each person has two copies of the SMN1 gene. In ALS, an abnormal number of copies of SMN1 gene have been reported in patients with sporadic ALS. One or three copies of the gene (instead of two) have been associated with increased/decreased SMN1 protein production as a possible cause of death of spinal motor neurons. SMN2 gene (Survival Motor Neuron 2) The second part of the SMN gene which is the centromeric copy. It is responsible for encoding truncated isoform and has a smaller effect on the production of SMN protein. SMN 2 has been found to be deleted in cases of sporadic ALS, which is a potential risk factor for ALS secondary to death of lower motor neurons through modulation of SMN protein. Glial fibrillary acidic protein (GFAP) GFAP is a gene that encodes glial fibrillary acidic protein. The protein is an intermediate filament found in mature astrocytes and a marker used to determine astrocytes from other glial cells while they are developing. Possible involvement in controlling the shape, movement and function of astroglial cells. There is an upregulation of GFAP in the ALS spinal cord due to astrogliosis. Yoshii et al found that loss of GFAP in SOD1 mouse models had only a slight affect on progression of ALS most likely due to activating microglia and astrocytes. GFAP most likely plays a role in regulation of reactive gliosis and is not entirely necessary for the initiation of the ALS disease process. In human mutant SOD1 mice, GFAP labeled astrocytes were not clustered early in the disease and seemed to become more prominent later in the disease, but continued to be dispersed at the end stage of the disease. Proteins - TDP-43 TDP-43 is defined as a ubiquitously expressed protein, located in the cell’s nucleus, that is encoded by the TARDBP gene, located on chromosome 1. This DNA/RNA binding protein is involved in the regulation of transcription, alternative splicing, mRNA stabilization, and mircoRNA processing. Wild-type TDP-43 is mainly found in the nucleus of the cell. Under conditions of stress, over-expression, or in the presence of mutation, TDP-43 moves from the nucleus to the cytoplasm. The over-expression of mutant TDP-43 results in increased cytoplasmic localization and the formation of inclusions. A transgenic mouse model expressing a mutated form of human TDP-43 resulted in ubiquitylated cytoplasmic inclusions, deficits in the motor system and an earlier onset of death. Similarly, another study observing the effects of mutant human TDP-43 in a transgenic mouse model demonstrated motor dysfunction including spactisity, weakness, a reduction in spontaneous movement, and earlier onset of death as compared to transgenic mice with the human wild-type TDP-43. PGC-1α Peroxisome proliferator-activated receptor (PPAR)-γ coactivator (PGC)-1α is defined as a transcription coactivator that works together with other proteins to influence adaptive thermogenesis, mitochondrial biogenesis, metabolism of glucose/fatty acid, switching of fiber types in skeletal muscle, and development of the heart. Chromosome 4 is the location of the PGC-1α gene in humans. At this time there is no evidence that directly links PGC-1α in the pathogenesis of ALS. However, one of the mechanisms involved in the pathology of ALS is mitchochondrial dysfunction, which has multiple effects on the cell. Since PGC-1α is involved in mitochondrial biogenesis, the effect of this gene in ALS has been explored. A study by Zhao et al looked at the effect of an over-expression of PGC-1α in an SOD1 transgenic mouse model of ALS (SOD1-G93A). Significant improvement in the clinical signs of ALS were seen in the double transgenic mice. In addition to the motor performance improvement, a significant motor neuron perseveration was found. Additionally, the electron transport chain activities in the mitochondria demonstrated greater preservation in the double transgenic mice. Less end stage weight loss and increased life span was seen in the double transgenic mice as compared to the single SOD1 transgenic mice. Liang et al demonstrated that an overexpression of PGC-1α can slow the progression of ALS and improve motor performance in mice also overexpressing SOD1(G93A). The improvement in motor performance appears to be related to the significant reduction in motor neuron cell death in the double transgenic mice. Prior to disease onset, skeletal muscle PGC-1α mRNA expression was decreased in the G93A transgenic mice. Therefore, an over-expression may be beneficial to alter the paralysis and atrophy of muscles, which was shown in the early stage of the disease for the double transgenic mice. By the time the G93A mice were symptomatic, mRNA expression of PGC-1α in the spinal cord progressively decreased which demonstrated increases in the double transgenic mice in the early stage of the disease. Overall, expression of PGC-1α demonstrates decline with the progression of disease in a mouse model of ALS. Additionally, late stage decreases in EAAT2 protein levels were seen for the G93A transgenic mice and an over-expression of PGC-1α led to a significantly greater level of EAAT2. This finding is important because neurons may be protected from excitotoxic cell death as a result of the increased levels of glutamate, which is implicated in the pathogenesis of this disease. SMN protein Production of SMN protein is modulated through the production of SMN 1 and SMN 2 genes. Production of the protein is based on the number of copies of SMN 1 and SMN 2 are located in the body. SMN protein is found in the spinal cord and throughout the cell. Abnormal amounts of SMN protein is speculated to interfere with normal cell metabolism and cause motor neuron degeneration. Reduced levels of SMN protein in the spinal cord has been found in transgenic SOD-1 mice and is postulated as a factor for the pathogenesis of the progression of the disease. However, in a human randomized control trial the amount of SMN protein in the cytoplasm, nucleus, and anterior horn cells revealed no statistical difference between patients with ALS and their controls. S100 beta Calcium-binding protein found in astroglial cells that is a neuronal marker in cerebrospinal fluid. Enhanced activity of S100 beta noted in the spinal cord of control mice with ALS. Up-regulated activity of the S100 beta could increase neurodegeneration through calcium pathways. TAU proteins Phosphorylated microtubule-associated protein usually located in neuronal axons . Can also be located in cerebrospinal fluid where it has been determined to be a marker for neuronal damage in different CNS disease  Found to be elevated in cerebrospinal fluid in 70% of ALS patients as compared to age-related control subjects . Highest elevation of TAU was noted in early disease stage . Astrocytes Astrocytes are considered to have a direct role in cell signaling. Specifically, astrocytes help to regulate neuronal activity through the spread of Ca2+ waves to adjacent cells. Astrocytes are involved in the action of the glial glutamate amino acid transporter EAAT2 by rapidly recovering synaptic glutamate to allow for support of the neuron and termination of glutamate. [13, 44] Astrocytes are responsible for preventing glutamate excitotoxicity in the spinal cord. They help with maintaining ion concentration in the extracellular space by taking up K+ and removing chemical transmitters from the synaptic cleft and maintain neuronal homeostasis. [26, 131] Astrocytes are also important factors in maintaining the blood brain barrier. [26, 131] They also produce intermediate filaments, such as GFAP, which provide support to the cytoskeleton. Evidence demonstrates that astrocyte activity may be one of the first cellular responses seen after CNS injury. Astrocytes inability to clear glutamate from the extracellular space, due to deficiency in the glutamate transporter EAAT2, leads to glutamate excitotoxcity and increased Ca2+ decreasing the storage capabilities of the mitochondria and endoplasmic reticulum. Cell culture studies demonstrated that increased activation of astrocytes result in motor neuron degeneration as a result of production of nerve growth factor (NGF). NGF in combination with nitric oxide can result in cell apoptosis a possible contributor to ALS. Neurofilaments Although the mechanism is unclear, neurofilaments play an important role in determining the diameter of axons, and are a major cytoskeletal component of myelinated axons. Neurofilament misaccumulation can interfere with the cytoskeletal organization of the axon, and this form of axonal disorganization is a hallmark sign in both sporadic and inherited forms of ALS. Release of cytoskeletal proteins in the body may lead to an autoimmune response and the development of antibodies to neurofilaments, and the increased level of serum anti-NFL antibodies in patients with ALS is inversely correlated with patient disability. Glutamate Glutamate is the primary excitatory neurotransmitter found throughout the nervous system. Released from vesicles in the presynaptic cleft, glutamate’s release is modulated by a variety of presynaptic receptors. In the synaptic cleft, glutamate binds to one of several post-synaptic receptors, including NMDA and AMPA receptors. Glutamate is then actively removed from the synaptic cleft via one of several transporters. A loss of astroglial glutamate transporter leads to a reduction in glutamate transport, increasing the extracellular concentration of glutamate and thus leading to glutamate receptor-mediated excitotoxicity, though these effects are seen in other neurodegenerative diseases as well as ALS. Glutamate excitotoxicity may also occur through an agonist effect on NMDA, AMPA, or G protein-coupled glutamate receptors, leading to neuronal death. Microglia Microglia are the immune cells of the brain that are derived from monocyte cells. Microglia are paramount to the innate immunity response and are activated upon an immune stimulus performing both infiltration and proliferative responses in CNS tissue. Microglia perform macrophage functions such as scavenging, phagocytosis, antigen presentation and inflammatory cytokine production, which clear pathogens due to illness. Astrocytes work in conjunction with microglia during this process. Once the microglia have cleared the pathogens due to the immune response, they return to a dormant state. Microglia may provide a protective immune response in neurological disorders. Microglia are also responsible for activating T-cells and releasing cytokines to decrease inflammation. Some of the cytokines released can lead to demyelinization and cell death. The rate and timing of microglia activation in ALS is controversial in the research. It is unknown whether this occurs during the disease process or rather after dying-back axonopathy. Henkle et al did determine that prior to motor neuron loss, microglia activity is initiated and increased compared to normal immune response. Cyclooxygenase-2 (COX-2) is produced by microglia and produces a pro-inflammatory response and expression of COX-2. Another possible mechanism related to microglia and resultant motor neuron degeneration is the tumor necrosis factor-a (TNFa), which is produced at higher levels in SOD1 microglia when stimulated with lipopolysaccharide. Microglia have also been shown to have 2 different types of activation in ALS. M2 activated microglia block inflammatory cytokines and assist in inflammation resolution. This process appears to be mediated by CD4+ T-cells. Later in the disease process M1 activated microglia are present. M1 Microglia are cytotoxic. Decreased levels of mSOD1 levels of expression in microglia has been associated with slower disease progression. Tumor Necrosis Factor Alpha (TNF-a) TNF is an important cytokine that demonstrates multiple overlapping functions with IL-1 such as stimulation of leukocyte adhesion, modulates coagulation, stimulation of inflammatory mediators, activation of fibroblasts, chondrocytes and osteoclasts. Systemically, TNF does a numbers of metabolic, hemodynamic and hematologic functions. TNF-a is just one subset of the overall TNF family of cytokines. G93A SOD1 mice demonstrate increased levels of TNF-a in their spinal cord. More importantly, the level of TNF-a and its receptors are found to increase just prior to the onset of symptoms (about 80 days prior) and then elevate once again at about 120 days into the symptomatic stage. In the spinal cords of G93A SOD1 mice, when IL6 and IFN-b were present the level of TNF-a increased substantially compared to when those two factors were not present. In the spinal cords of these mice TNF-a caused an influx of NO2 (nitrate) which ultimately represents manifestation of iNOS. Serum IgG IgG or immunoglobin G is secreted by plasma cells most commonly located in the lymphoid or mucousal tissue and is the most common antibody in the blood responsible for humoral immunity and secondary antibody responses. IgG is an antibody that is specific to the antigen that originally initiated the acquired immune response and remains circulating in the body fluids as an antibody-antigen complex.. There are 4 subclasses of IgG: IgG1, IgG2, IgG3 and IgG4, each which perform functions such as neurtralization of bacteria and enhancement of phagocytosis. Serum IgG and IgM were found to change with disease progression in sALS. For example, IgM was found to be significantly higher in patients early in the sALS disease process while IgG was found to be normal. As the disease progressed patients demonstrated lower levels of IgG and normal levels of IgM when compared to controls. Serum IgM The first antibody to be produced during an immune response is IgM. Expression of IgM is important for B-cell expression. IgM interacts directly with pathogens to help limit the severity of infection. Additionally, recent discoveries have linked IgM with functions related to B-cell homeostasis, inflammation, atheroscerlosis and autoimmunity. Serum IgG and IgM were found to change with disease progression in sALS. For example, IgGM was found to be significantly higher in patients early in the sALS disease process while IgG was found to be normal. As the disease progressed patients demonstrated lower levels of IgG and normal levels of IgM when compared to controls. IGF-1 Refer to the link to the left for normal IGF-1 function. Insulin-like growth factor-1 (IGF-1), a trophic factor, administered in a retrograde method using adeno-associated virus (AAV), has previously demonstrated prolonged survival in SOD1 mice even when administered at the onset of clinical ALS symptoms. [145,146] AAV allows for indirect transport of IGF-1 to the neurons via the muscle. The effects of injected AAV-IGF-1 to the hindlimb and intercostal muscles demonstrated maintenance of motor neuron counts compared to wild-type mice at 90 days, decreased astrogliosis, minimal evidence of TUNEL staining at 110 days illustrating decreased apoptosis and decreased caspase-3 and-9 cleavage. AAV-IGF-1 administered via the central nervous system, deep cerebellar nuclei (DCN), of SOD1 mice also has demonstrated alteration in the ALS disease process such as prolonged survival and improved muscle strength resulting in transport of IGF-1 to not only the DCN of the brain, but also the brainstem and spinal cord. IGF-1 resulted in not only prolonged survival rate, but also reduction of glial cell-mediated release of TNF-α and nitric oxide, migroglial activation, peroxynitrite formation and astrogliosis in these mice. IGF-1 plays a beneficial role in the slowing of the disease process of ALS, yet multiple mechanisms of action are portrayed via its administration to mutated mice with SOD1 and the direct action that IGF-1 plays in the prolonged survival of these mice is unknown requiring further research in this area. Natural Killer T-cells (NKT) When activated NKT cells release IL-4, IL-2, IL-13, IL-17, IL-21,TNF alpha and IFN gamma. Dysfunction has been linked to several autoimmune diseases. [147,148] Elevated levels of NKT cells have been found in the spinal cord, spleen and liver of ALS patients as the disease progresses, all of which atrophy in ALS. These cells were found to secrete increased levels of IL-4, IL-10, TNF alpha and IFN gamma [147,148]. CD-4 T cells CD4+ T-cells activate macrophages and cytotoxic T-cells. They release cytokines that regulate and or assist with active immune response. They are also memory T-cells in that they persist in an antigen persistent state after being exposed to an antigen. [139,149] CD4+ T-cells have been found in the blood in ALS suggesting a systemic immune response and in areas of motorneuron destruction. [139,149] IL-13 producing T-cells also have been shown in the blood, and increased levels have been correlated with disease progression. HIV HIV is a retrovirus that attacks CD4+ T-cells which are important for fighting off disease. It normally does not attack nerve cells. HIV does not normally attack neural cells. ALS-like symptoms have been reported in higher frequency, earlier onset (34.8yrs), more rapid progression of symptoms and increased pathology evident in CNS, and many responded to treatment with anti-retroviral drugs. [151,149] However, among individuals diagnosed with true ALS symptom onset, progression has been the same as for non-HIV positive individuals. Additionally, there was no response to anti-retrovirals in these patients. Creatine Kinase in serum Released into the blood stream as a marker for muscle damage. Creatine kinase increased in 70% of ALS patients up to threefold of normal levels . Higher levels of creatine kinase were noted in later stages of the disease. Inducible nitric oxide synthase (iNOS) Like COX-2, iNOS is a marker for macrophage activation during inflammation. iNOS is located on chromosome 17 and functions independently of calcium unlike other NOS isoforms. iNOS is key to the production of nitric oxide. iNOS is important for clearance of bacterial, viral, fungal and parasitic infections. Excess production of NO from iNOS has been associated with organ and tissue damage. In spinal cords with ALS the macrophages were found to contain not only COX-2, but also positive iNOS, which in previous studies on Alzheimer’s disease and HIV encephailitis found macrophages and monocytes activated by COX-2 and iNOS. This possible mechanism for neuroinflammation caused by these leukocytes is thought to be a cause of neurodegeneration seen in ALS. In mice with the mutant SOD1 (G93A) iNOS was seen to increase correlated with increased motor neuron death and glial activation. This leads to potential use of iNOS inhibition for treatment of patients with ALS, yet no trials have been attempted. Prostaglandin-endoperoxide synthase 2 (Cyclooxygenase-2 (COX-2)) COX-2, an enzyme responsible for the production of prostnoids (prostaglandins, rostacyclins, and thromboxanes) is most often present at sites of inflammation in the body. Mast cells express COX-2 and COX-2 is a marker for macrophage activation during inflammation. Two isozymes make up COX-2 including PTGS1 and PTGS2. COX-2 expression is related to multiple other cellular factors including: multiple growth factors, cytokines interleukin (IL)-1h tumor necrosis factor-a TNFa, lipopolysaccharide (LPS), phorbol ester, and elevated intracellular calcium concentration. COX-2 immunoreactivity in the glial cells and neurons of the spinal cord is upregulated in SOD1 transgenic mice models. Additionally, in the spinal cord COX-2 and PGE2 is increased near seven fold in post mortem patients with ALS. [159,160] Other increases seen in the spinal cord include: COX-2 mRNA and protein levels, COX catalytic activity, and PGE2 levels. The prostaglandin PGE2 is associated with ALS pathogenesis due to its correlation with increased glutamate induced motor-neuron loss. Zinc Homeostasis of zinc ions in the brain and body is important for normal functioning, and zinc ions have been found to be in higher concentrations in the brain than in other body tissues. Zinc plays an important role in synaptic transmission, nucleic acid metabolism, and brain microtubule growth, acts as a neuromodulator, and helps maintain post-synaptic density. The SOD1 gene binds zinc, and metallothioneins (MTs) are responsible for the regulation of cellular levels of zinc. Some SOD1 mutations have demonstrated altered binding patterns of zinc, and alterations of metallothioneins have been found in mouse models of ALS. MT deletion in mice contributes to disease progression. Copper Copper is a metallic element that is essential to the human body, yet the body is unable to synthesize copper and it must be absorbed. Copper binds with proteins in the body producing enzymes for various catalyst reactions. Copper performs multiple functions within the body including: pigmentation of the skin with melanin, crosslinking of collagen and elastin (important for the heart and arteries) and provides energy. In a normal functioning body copper binds with the protein SOD as seen above. In patients with the mutant SOD1 gene, copper does not properly bind with the SOD protein resulting in ALS. Copper ions can be transformed into wild-type and mutant SOD1 with a copper chaperone protein. In mice the disruption of the gene utilized for the transformation of the copper chaperone protein has demonstrated positive effects at reducing SOD1 activity in the CNS of mice. [13,164] Currently, a question that has been raised it whether the elimination of copper loading onto a mouse with mutated SOD1 would help to determine whether the toxic effect is caused by copper mediated catalysis. Estrogen For normal function of estrogen, click here. A study by Choi et al looked at the effect of gender on lifespan and motor function in a transgenic mouse model of ALS expressing mutant human SOD1 (hSOD1-G93A). The study demonstrated an association between gender and disease progression in the transgenic mouse model. An earlier onset of symptoms, greater weight loss, greater motor deficit, and decreased lifespan were seen for male transgenic mice as compared to females. When female transgenic mice underwent an ovariectomy, a similar pattern of survival and progression of the disease was demonstrated. The use of estrogen replacement therapy following the ovariectomy yielded an increased lifespan as compared with ovariectomized mice without the estrogen replacement therapy. Overall, the levels of estrogen appear to be related to motor dysfunction and disease progression in a mouse model of ALS and may yield beneficial effects for females with ALS. After diagnosis of ALS by a neurologist, a multidisciplinary approach to the disease process should be initiated for the patient and the potential caregiver. Often, patients can be referred to a specialty multidisciplinary clinic for patients with ALS. Specialty clinics have a variety of healthcare professionals with experience with ALS including neurologists, nurses, speech therapists, occupational therapists, physical therapists, and psychologists. Early involvement in specialty clinics has been proven to be beneficial to prolong life and improve quality of life in patients with ALS [166,167] Decreased hospital visits and shorter duration of hospital stays have also been reported in those that attend specialty clinics. Since there is no current preventative or curative treatment, medical management of ALS attempts to improve quality and duration of life through neurotropic factors and symptom management. Over 15 different clinical trials have been performed using various drugs to determine their therapeutic benefit in ALS with no avail. Current trials of a variety of other drugs are also in beginning phases of research with no proven effects reported. Riluzole is the only drug that has consistently demonstrated positive improvements in extending the duration of life in individuals with ALS. Currently, riluzole is the only approved drug by the Food and Drug Administration (FDA) for treatment of ALS with a three month improvement in duration of life. Other randomized controlled trials have indicated Riluzole slowed the progression of the disease for up to 4 months while retrospective studies have indicated that survival can be prolonged 4-19 months. [171,172] Riluzole is a glutamate inhibitor and is proposed to work by inhibiting presynaptic release of glutamate. Glutamate is an excitatory neurotransmitter which is hypothesized to be linked with neurodegeneration when in excess. Through meta-anaylsis, the effective dose of riluzole is 100 mg/day orally to increase survival. Riluzole should be initiated as early in the disease process as possible as it has shown to have very little effect in the late stages of the disease. Furthermore the early initiation of the drug has higher levels of success secondary to the preservation of motor units. No serious side effects have been reported with riluzole use but routine liver enzyme levels must be closely monitored for neutropenia. Drug administration should be stopped if liver function tests exceed five times the normal values. Non-life threatening side effects that have been reported are fatigue, somnolence, nausea, gastrointestinal sid.e effects, and dizziness. With the lack of a curative treatment, individuals with ALS rely on other pharmaceutical interventions to control ALS associated symptoms and improve quality of life. The symptoms that effect quality of life the most and are therefore managed medically are sialorrhoea, bronchial secretions, pseudobulbar emotional liability, cramps, spasticity, depression/insomnia, and pain. Respiratory muscle weakness is a common clinical feature of ALS causing dyspnea, orthopnea, and nocturnal hypoventilation. Such bulbar weakness can lead to a weak cough and poor secretion management making airway clearance and infection management difficult. Three month routine follow-ups should be performed to monitor patient symptoms, overnight pulse oximetry, and vital capacity. Non-invasive positive pressure ventilation, using performed by a bilevel positive pressure device (BiPAP), is begun intermittently to treat nocturnal hypoventilation. The American Academy of Neurology ALS Practice Parameter proposes beginning non-invasive ventilation when forced vital capacity reaches 50% or less of the predicted value. but other sources cite that a forced vital capacity of 75% or less of the predicted value is more appropriate. Randomized control trials have found non-invasive ventilation improves the quality of life and survival then those not on ventilation. Invasive management is considered when respiratory insufficiency cannot be managed non-invasive techniques. Invasive ventilation by tracheostomy is the next step, however, the patient and care giver should discuss this option prior to the advancement of the disease. Although tracheostomy is shown to prolong survival, patients are rarely free from the ventilators and have decreased quality of life compared to those that choose non-invasive ventilation. If invasive management is not chosen, pharmacological approaches to end-of life care are begun. Poor nutrition is often a result of swallowing difficulties and dysphagia in patients with ALS. However, upper extremity weakness and reliance on caregiver for assistance with feeding can also lead to decreased intake. Since nutrition is directly correlated with survival, nutrition and swallowing abilities should be addressed by a speech and language therapist. Consistencies of food should be thickened in patients with difficulty swallowing and a chin-tuck maneuver should be taught increase swallowing abilities. When weight loss and malnutrition continue, percutaneous endoscopic gastrostomy (PEG) is the standard for patients with ALS. It is recommended that the PEG placement be performed prior to a vital capacity of less than 50% to avoid respiratory decline when the patient undergoes the procedure. A new alternative to a PEG placement is percutaneous radiologic gastrostomy (PRG). PRG has been shown to have a higher success rate than PEG and can be used regardless of respiratory condition because placement does not require sedation. Amyotrophic lateral sclerosis is a complex disease that involves a number of different cellular components including genes, mitochondria, golgi apparatus, immune cells, cytokines, interleukins, glutamate excitotoxicity and oxidative stress that results in the scarring of motor neurons. Additional cellular factors may be involved as researchers continue to attempt to identify the cause of ALS. There are currently not clear cut risk factors or causative factors in 90% of ALS cases, with more research needed to accurately identify individuals at-risk for developing ALS. There is currently only one drug approved for the treatment of ALS, with research currently being performed on multiple other drugs. A multidisciplinary approach is currently used for treatment including nutrition, drug management, hospice care, physical, occupational and respiratory therapy. Despite all current available treatments ALS is always fatal. More research is needed to identify the pathophysiology of ALS and effective treatments. 2. Hervias I, Beal MF, Manfredi G. Mitochondrial dysfunction and amyotrophic lateral sclerosis. Muscle Nerve. 2006; 33(5): 598-608. 3. Goodman CC, Fuller KS. Pathology: Implications for the Physical Therapist, 3rd ed. Philadelphia: Saunders; 2009. 4. Mahoney DJ, Rodriguez C, Devries M, Yasuda N, Tarnopolsky MA. Effects of high-intensity endurance training in the G93A mouse model of amyotrophic lateral sclerosis. Muscle Nerve. 2004; 29 (5): 656-662. 5. Chio A, et al. Prognostic factors in ALS: a critical review. Amyotroph Lateral Sc. 2009; 10 (5-6): 310-323. 6. Foran E, Trotti D. Glutamate transporters and the excitotoxic path to motor neuron degeneration in amyotrophic lateral sclerosis. Antioxid Redox Signal. 2009; 11 (7): 1587-1602. 7. Gordon PH. Amyotrophic Lateral Sclerosis: pathophysiology, diagnosis and management. CNS Drugs. 2011; 25 (1): 1-15. 8. Pasinelli P, Brown RH. Molecular biology of amyotrophic lateral sclerosis: insights from genetics. Nat Rev Neurosci. 2006; 7(9): 710-723. 9. O’Sullivan SB, Schmitz TJ. Physical Rehabilitation, 5th ed. Philadelphia: F.A. Davis; 2007. 10. Manfredi G, Xu Z. Mitochondrial dysfunction and its role in motor neuron degeneration in ALS. Mitochondrion. 2005; 5 (2): 77-87. 11. Norris F, et al. Onset, natural history and outcome in idiopathic adult motor neuron disease. J Neurol Sci. 1993; 118 (1): 45-55. 12. Brooks BR, Miller RG, Swash M, Munsat TL. El Escorial revisited: revised criteria for the diagnosis of amyotrophic lateral sclerosis. Amyotroph Lateral Scler Other Motor Neuron Disord. 2000; 1 (5): 293-299. 13. Rowland LP, Shneider NA. Amyotrophic lateral sclerosis. N Engl J Med. 2001;344(22):1688-1700. 14. Brooks BR. Risk factors in the early diagnosis of ALS: North american epidemiological studies. ALS CARE study group. Amyotroph Lateral Scler Other Motor Neuron Disord. 2000;1 Suppl 1:S19-26. 15. Furby A, Beauvais K, Kolev I, Rivain JG, Sebille V. Rural environment and risk factors of amyotrophic lateral sclerosis: A case-control study. J Neurol. 2010;257(5):792-798. 16. McGuire V, Longstreth WT,Jr, Nelson LM, et al. Occupational exposures and amyotrophic lateral sclerosis. A population-based case-control study. Am J Epidemiol. 1997;145(12):1076-1088. 17. Gallo V, Bueno-De-Mesquita HB, Vermeulen R, et al. Smoking and risk for amyotrophic lateral sclerosis: Analysis of the EPIC cohort. Ann Neurol. 2009;65(4):378-385. 18. Armon C. An evidence-based medicine approach to the evaluation of the role of exogenous risk factors in sporadic amyotrophic lateral sclerosis. Neuroepidemiology. 2003;22(4):217-228. 19. Slowik A, Tomik B, Wolkow PP, et al. Paraoxonase gene polymorphisms and sporadic ALS. Neurology. 2006;67(5):766-770. 20. Siddons MA, Pickering-Brown SM, Mann DM, Owen F, Cooper PN. Debrisoquine hydroxylase gene polymorphism frequencies in patients with amyotrophic lateral sclerosis. Neurosci Lett. 1996;208(1):65-68. 21. Arnold A, Edgren DC, Palladino VS. Amyotrophic lateral sclerosis: fifty cases observed on Guam. J Nerv Ment Dis. 1953;117:135-9. 22. Chen H, Richard M, Sandler DP, Umbach DM, Kamel F. Head injury and amyotrophic lateral sclerosis. Am J Epidemiol. 2007;166(7):810-816. 23. Al-Ajmi A, Rousseff RT, Khuraibet AJ. Clinically definite ALS presenting weeks after mild electric injury: Causality or coincidence? Neurol Sci. 2012. 24. Hanby MR, Scott KM, Scotton W, Wijesekera L, Mole T, Ellis CE, Leigh PN et al. The risk to relatives of patients with sporadic amyotrophic lateral sclerosis. Brain. 2011; 134: 3451-3454. 25. ALS Association. http://www.alsa.org/. Last reviewed 2010. Accessed January 18, 2012. 26. Ince PG, Highley JR, Kirby J, Wharton SB, Takahashi H, Strong Mj et al. Molecular pathology and genetic advances in amyotrophic lateral sclerosis: an emerging molecular pathway and the significance of glial pathology. Acta Neuropathol. 2011; 122:657-671. 27. Majoor-Krakauer D, Ottman R, Johnson WG, Rowland LP. Familial aggregation of amyotrophic lateral sclerosis, dementia, and Parkinson’s disease: evidence of shared genetic susceptibility. Neurology 1994;44:1872-7. 28. Amyotrophic lateral sclerosis. http://www.ncbi.nlm.nih.gov/pubmedhealth/PMH0001708/. Last reviewed August 27 2010. 29. Ferguson TA, Elman LB. Clinical presentation and diagnosis of amyotrophoc lateral sclerosis. Neuro Rehabil 2007:22;409-416. 30. Fujimura-Kiyono C, Kimura F, Ishida S, Kakajima H, Hosokawa T Sugino et al. Onset and spreading patterns of lower motor neuron involvements predict survival in sporadic amyotrophic lateral sclerosis. J Neurol Neurosurg Psychiatry 2011:82;1244-49. 31. Prevelance and patterns of cognitive impairment in sporadic ALS. Neurology 2005:64;586-91. 32. Ross MA, Miller RG, Berchert L, Parry G, Barohn RJ, Armon C et al. 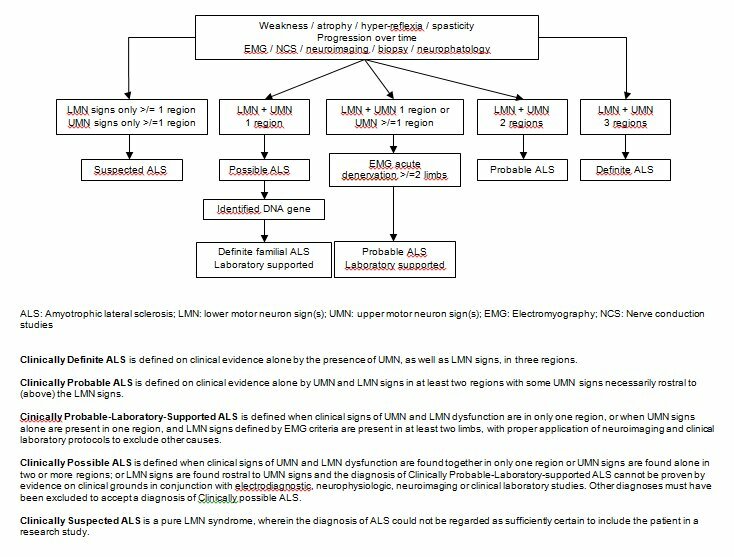 Toward earlier diagnosis of amyotrophic lateral sclerosis: revised criteria. rhCNTF ALS study group. Neurology 1998:50;768-72. 33. Hardiman O, van den Berg LH, Kieman MC. Clinical diagnosis and management of myotrophic lateral sclerosis. Nat Rev Neurol 2011:7;639-49. 34. Brooks BR. El Escorial World Federation of Neurology criteria for the diagnosis and management of amyotrophic lateral sclerosis. J Neurol Sci 1994:124;96-107. 35. Schrooten M, Smetcoren C, Robberecht W, Van Damme P. Benefit of the Awaji diagnostic algorithm for amyotrophic lateral sclerosis: a prospective study. Ann Neurol 2011:70;19-83. 36. Cedarbaum JM, Stambler S, Malta E, Fuller C, Hilt D, Thurmond B et al. The ALSFRS-R: a revised ALS functional rating scale that incorporates assessments of respiratory function. J Neurol Sci 1999:169;13-21. 37. Stambler N, Charatan M, Cedarbaum JM et al. Prognostic factors of survival in ALS. Neurology 1998:50;66-72. 38. Kilic E, et al. The superoxide dismutase1 (SOD1) G93A mutation does not promote neuronal injury after focal brain ischemia and optic nerve transection in mice. Neuroscience. 2004; 128 (2): 359-364. 39. Bendotti C, Carri MT. Lessons from models of SOD1-linked familial ALS. Trends Mol Med. 2004; 10 (8): 393-400. 40. Shaw PJ. Molecular and cellular pathways of neurodegeneration in motor neurone disease. J Neurol Neurosurg Psychiatry. 2005; 76 (8): 1046-1057. 41. Ilieva H, Polymenidou M, Cleveland DW. Non-cell autonomous toxicity in neurodegenerative disorders: ALS and beyond. J Cell Biol. 2009;187(6):761-772. 42. Blair IP, et al. FUS mutations in amyotrophic lateral sclerosis: clinical, pathological, neurophysiological and genetic analysis. J Neurol Neurosurg Psychiatry. 2010; 81 (6): 639-645. 43. Museth AK, Brorsson AC, Lundqvist M, Tibell LA, Jonsson BH. The ALS-associated mutation G93A in human copper-zinc superoxide dismutase selectively destabilizes the remote metal binding region. Biochemistry. 2009; 48 (37): 8817-8829. 44. Boillee S, Vande Velde C, Cleveland DW. ALS: a disease of motor neurons and their nonneuronal neighbors. Neuron. 2006; 52 (1): 39-59. 45. Brown RH, Phil D. A transgenic-mouse model of Amyotrophic Lateral Sclerosis. N Engl J Med. 1994; 331: 1091-1092. 46. Zhao W, et al. Peroxisome proliferator activator receptor gamma coactivator-1alpha (PGC-1a) improves motor performance and survival in a mouse model of amyotrophic lateral sclerosis. Mol Neurodegener. 2011; 6 (1): 51. 47. Harvey BK, Hoffer BJ. Transgenic animal models of neurodegeneration based on human genetic studies. J Neural Transm 2011:118;27-45. 48. Llado J, et al. Degeneration of respiratory motor neurons in the SOD1 G93A transgenic rat model of ALS. Neurobiol Dis. 2006; 21 (1): 110-118. 49. Liang H, et al. PGC-1α protects neurons and alters disease progression in an amyotrophic lateral sclerosis mouse model. Muscle Nerve. 2011; 44 (6): 947-956. 50. Deng HX, et al. Conversion to the amyotrophic lateral sclerosis phenotype is associated with intermolecular linked insoluble aggregates of SOD1 in mitochondria. Proc Natl Acad Sci USA. 2006; 103 (18): 7142-7147. 51. Gurney ME, et al. Motor neuron degeneration in mice that express a human Cu, Zn superoxide mismutase mutation. Science. 1994; 264 (5166): 1772-1775. 52. Reaume AG, et al. Motor neurons in Cu/Zn superoxide dismutase-deficient mice develop normally but exhibit enhanced cell death after axonal injury. Nat Genet. 1996; 13 (1): 43-47. 53. Muller FL, et al. Absence of CuZn superoxide dismutase leads to elevated oxidative stress and acceleration of age-dependent skeletal muscle atrophy. Free Radic Biol Med. 2006; 40 (11): 1993-2004. 54. Audet JN, Gowing G, Julien JP. Wild-type human SOD1 overexpression does not accelerate motor neuron disease in mice expressing murine Sod1 G86R. Neurobiol Dis. 2010; 40 (1): 245-250. 55. Turner BJ, Talbot K. Transgenics, toxicity and therapeutics in rodent models of mutant SOD1-mediated familial ALS. Prog Neurobiol. 2008; 85 (1): 94-134. 56. Nagai M, et al. Rats expressing human cytosolic copper-zinc superoxide dismutase transgenes with amyotrophic lateral sclerosis: associated mutations develop motor neuron disease. J Neurosci. 2001; 21 (23): 9246-9254. 57. Herbik MA, Chrapusta SJ, Kowalczyk A, Grieb P. Maintenance of the rat transgenic model of familial amyotrophic lateral sclerosis expressing human SOD1G93A mutation. Folia Neuropathol. 2006; 44 (3): 149-153. 58. Howland DS, et al. Focal loss of the glutamate transporter EAAT2 in a transgenic rat model of SOD1 mutant-mediated amyotrophic lateral sclerosis (ALS). Proc Natl Acad Sci USA. 2002; 99 (3): 1604-1609. 59. Nicaise C et al. Impaired blood-brain and blood-spinal cord barriers in mutant SOD1-linked ALS rat. Brain Res. 2009;1301:152-162. 60. Chan PH, et al. Overexpression of SOD1 in transgenic rats protects vulnerable neurons against ischemic damage after global cerebral ischemia and reperfusion. J Neurosci. 1998; 18 (20): 8292-8299. 61. Higgins CM, Jung C, Ding H, Xu Z. Mutant Cu,Zn superoxide dismutase that causes motoneuron degeneration is present in mitochondria in the CNS. J Neurosci. 2002;22:RC215. 62. Jaarsma D, Rognoni F, van Duijn W, Verspaget HW, Haasdijk ED, Holstege JC. CuZn superoxide dismutase (SOD1) accumulates in vacuolated mitochondria in transgenic mice expressing amyotrophic lateral sclerosis-linked SOD1 mutations. Acta Neuropathol. 2001;102:293-305. 63. Karbowski M, Neutzner A. Neurodegeneration as a consequence of failed mitochondrial maintenance. Acta Neuropathol. 2012;123:157-171. 64. Li Q et al. ALS-linked mutant superoxide dismutase 1 (SOD1) alters mitochondrial protein composition and decreases protein import. Proc Natl Acad Sci USA. 2010;107(49):21146-21151. 65. Afifi AK, Aleu FP, Goodgold J, MacKay B. Ultrastructure of atrophic muscle in amyotrophic lateral sclerosis. Neurology. 1966;16:475-481. Cited in: Manfredi G, Xu Z. Mitochondrial dysfunction and its role in motor neuron degeneration in ALS. Mitochondrion. 2005;5(2):77-87. 66. Atsumi T. The ultrastructure of intramuscular nerves in amyotrophic lateral sclerosis. Acta Neuropathol. 1981;55:193-198. Cited in: Manfredi G, Xu Z. Mitochondrial dysfunction and its role in motor neuron degeneration in ALS. Mitochondrion. 2005;5(2):77-87. 67. Hirano A, Donnenfeld H, Sasaki S, Nakano I. Fine structural observations of neurofilamentous changes in amyotrophic lateral sclerosis. J Neuropathol Exp Neurol. 1984; 43:461-470. Cited in: Manfredi G, Xu Z. Mitochondrial dysfunction and its role in motor neuron degeneration in ALS. Mitochondrion. 2005;5(2):77-87. 68. Sasaki S, Iwata M. Impairment of fast axonal transport in the proximal axons of anterior horn neurons in amyotrophic lateral sclerosis. Neurology. 1996; 47:535-540. Cited in: Manfredi G, Xu Z. Mitochondrial dysfunction and its role in motor neuron degeneration in ALS. Mitochondrion. 2005;5(2):77-87. 69. Siklos L et al. Ultrastructural evidence for altered calcium in motor nerve terminals in amyotrophic lateral sclerosis. Ann Neurol. 1996;39:203-216. Cited in: Manfredi G, Xu Z. Mitochondrial dysfunction and its role in motor neuron degeneration in ALS. Mitochondrion. 2005;5(2):77-87. 70. Wallace DC. The mitochondrial genome in human adaptive radiation and disease: On the road to therapeutics and performance enhancement. Gene. 2005;354:169-180. 71. Chabi B, Adhihetty PJ, Ljubicic V, Hood DA. How is mitochondrial biogenesis affected in mitochondrial disease? Med Sci Sports Exerc. 2005; 37 (12):2102-2110. 72. Kong J, Xu Z. Massive mitochondrial degeneration in motor neurons triggers the onset of amyotrophic lateral sclerosis in mice expressing a mutant SOD1. J Neurosci. 1998;18:3241-3250. 73. Reynolds IJ. Mitochondrial membrane potential and the permeability transition in excitotoxicity. Ann NY Acad Sci. 1999;893:33-41. 74. Wei R et al. Protein misfolding, mitochondrial dysfunction and muscle loss are not directly dependent on soluble and aggregation state of mSOD1 protein in skeletal muscle of ALS. Biochem Biophys Res Commun. 2012;417(4):1275-1279. 75. Sathasivam S, Ince PG, Shaw PJ. Apoptosis in amyotrophic lateral sclerosis: a review of the literature. Neuropath Appl Neuro. 2001;27:257-274. 76. Gustafsson AB, Gottlieb RA. Bcl-2 family members and apoptosis, taken to heart. Am J Physiol Cell Physiol. 2007; 292 (1): C45-51. 77. Antonsson B, Conti F, Ciavatta A et al. Inhibition of Bax channel-forming activity by Bcl-2. Science. 1997; 277: 370-372. 78. Shimizu S, Narita M, Tsujimoto Y. Bcl-2 family proteinsregulate the release of apoptogenic cytochrome c by the mitochondrial channel VDAC. Nature. 1999; 399: 483-487. 79. Kostic V, Jackson-Lewis V, de Bilbao F, Dubois-Dauphin M, Przedborski S. Bcl-2: prolonging life in a transgenic mouse model of familial amyotrophic lateral sclerosis. Science. 1997; 277: 559-562. 80. Troost D,Aten J,MorsinkF ,deJong JMBV. Apoptosisin amyotrophic lateral sclerosis is not restricted to motor neurons. Bcl-2 expression is increased in unaffected post-central gyrus. Neuropathol Appl Neurobiol. 1995; 21: 498-504. 81. Guegan C, Vila M, Rosokija G, Hays AP, Przedborski S. Recruitment of the mitochondrial-dependent apoptotic pathway in amyotrophic lateral sclerosis. J Neurosci. 2001;21:6569-6576. 82. Li M, Ona VO, GueÂgen C et al. Functional role of caspase-1 and caspase-3 in an ALS transgenic mouse model. Nature. 2000; 288: 335-339. 83. Reyes MA, Fisher JK, Austgen K, VandenBerg S, Huang EJ, Oakes SA. Blocking the mitochondrial apoptotic pathway preserves motor neuron viability and function in a mouse model of amyotrophic lateral sclerosis. J Clin Invest. 2010; 120 (10): 3673-3679. 84. Miyashita T, Harigai M, Hanada M, Reed JC. Identification of a p53-dependent negative responseelement in the bcl-2 gene. Cancer Res. 1994; 54: 3131-3135. 85. Miyashita T, Krajewski S, Krajewska M et al. Tumor suppressor p53 is a regulator of bcl-2 and bax gene expression. In Vitro Vivo Oncogene. 1994; 9:1799-1805. 86. Miyashita T, Reed JC. Tumor suppressor p53 is a direct transcriptional activator of the human bax gene. Cell. 1995; 80: 293-299. 87. de la Monte SM, Sohn YK, Ganju N, Wands JR. p53- and CD95-associated apoptosis in neurodegenerative disease. Lab Invest. 1998; 78: 401-411. 88. Prudlo J, Koenig J, Graser et al. Motor neuron cell death in a mouse model of FALS is not mediated by the p53 cell survival regulator. Brain Res. 2000; 879: 183-187. 89. Ekegren T, GrundstroÈm E, Lindholm D, Aquilonius S-M. Upregulation of Bax protein and increased DNA degradation in ALS spinal cord motor neurons. Acta Neurol Scand. 1999; 100: 317-321. 90. Hiraishi K, Suzuki K, Hakomori S, Adachi M. LeY antigen expression is correlated with apoptosis (pro- grammed cell death). Glycobiology. 1993; 3: 381-390. 91. Pedersen WA, Luo H, Kruman I, Kasarskis E, Mattson MP. The prostate apoptosis response-4 protein partici- pates in motor neuron degeneration in amyotrophic lateral sclerosis. FASEB J. 2000; 14: 913-924. 92. Kabashi E, Durham HD. Failure of protein quality control in amyotrophic lateral sclerosis. Biochimica et Biophysica Acta. 2006: 1762; 1038-1050. 93. Bendotti C, Marino M, Cheroni C, Fontana E, Crippa V, Poletti A, et al. Dysfunction of constitutive and inducible ubiquitin-proteasome system in amyotrophic lateral sclerosis: implication for protein aggregation and immune response.Prog Neurobiol. 2011:1162;1-26. 94. Ferrarese C,et al. Decreased platelet glutamate uptake in patients with amyotrophic lateral sclerosis. Neurology. 2001; 56 (2): 270-272. 95. Guo H, et al. Increased expression of the glial glutamate transported EAAT2 modulates excitotoxicity and delays the onset but not the outcome of ALS in mice. Hum Mol Genet. 2003; 12 (19): 2519-2532. 96. Sasabe J, Aiso S. Aberrant control of motoneuronal excitability in amyotrophic lateral sclerosis: excitatory glutamate/D-serine vs. inhibitory glycine/gamma-aminobutanoic acid (GABA). Chem Biodivers. 2010; 7 (6): 1479-1490. 97. Kim K, et al. Role of excitatory amino acid transporter-2 (EAAT2) and glutamate in neurodegeneration: opportunities for developing novel therapeutics. J Cell Physiol. 2011; 226 (10): 2484-2493. 98. Bendotti C, et al. Transgenic SOD1 G93A mice develop reduced GLT-1 in spinal cord without alterations in cerebrospinal fluid glutamate levels. J Neurochem. 2001; 79 (4): 737-746. 99. Rothstein JD, Van Kammen M, Levey AI, Martin LJ, Kuncl RW. Selective loss of glial glutamate transporter GLT-1 in amyotrophic lateral sclerosis. Ann Neurol. 1995; 38 (1): 73-84. 100. Boston-Howes W, Gibb SL, Williams EO, Pasinelli P, Brown RH, Trotti D. Capsase-3 cleaves and inactivates the glutamate transporter EAAT2. J Biol Chem. 2006; 281 (20): 14076-14084. 101. Barber SC, Shaw PJ. Oxidative stress in ALS: key role in motor neuron injury and therapeutic target. Free Radic Biol Med 2010:48;629-41. 102. Pryor WA, Squadrito GI. The product of perxynitrite: a product from the reaction of nitric oxide with superoxide. Am J Physiol 1995:268;1699-1722. 103. Ferrante RJ, Browne SE, Shinobu LA, Bowling AC, Baik MJ, MacGarvey U et al. Evidence of increased oxidative damage in both sporadic and familial amyotrophic lateral sclerosis. J Neurochem 1997:69;2069-74. 104. Nguyen MD, Aigle TD, Gowing G, Julien JP, Rivest S. Exacerbation of the motor neuron disease by chronic stimulation of innate immunity in a mouse model of amyotrophic lateral sclerosis. J Neurosci. 2004:24(6);1340-1349. 105. McCombe PA, Henderson RD. The role of immunity and inflammatory mechanisms in ALS. Curr Mole Med2011:11;246-254. 106. Graber DJ, Hickey WF, Harris BT. Progressive changes in microglia and macrophages in spinal cord and peripheral nerve in the transgenic rat model of amyotrophic lateral sclerosis. J Neuroinflamm. 2010:7(8);1-12. 107. Saleh IA, Zesiewicz T, Xie Y, Sullivan KL, Miller AM, Kuzmin-Nichols N, et al. Evaluation of humoral immune response in adaptive immunity in ALS patients during disease progression. J Neuroimmunol. 2009:215;96-101. 108. Zhang R, Gascon R, Miller RG, Gelinas DF, Mass J, Hadlock K, et al. Evidence for systemic immune system alterations in sporadic amyotrophic lateral sclerosis (sALS). J Neuroimmunol. 2005:159;215-224. 109. Shi N, Kawano Y, Tateishi T, Kikuchi H, Osoegawa M, Ohyagi Y, et al. Increased IL-13-producing T cells in ALS: positive correlations with disease severity and progression rate. J Neuroimmunol. 2007:182;232-235. 110. Chiu IM, Chen A, Zheng Y, Kosaras B, Tsiftsoglou SA, Vartanian TK, et al. T lymphocytes potentiate endogenous neuroprotective inflammation in a mouse model of ALS. Immunology. 2008:105(46); 17913-17918. 111. Zhang R, Gascon R, Miller RG, Gelinas DF, Mass J, Lancero M, et al. MCP-1 chemokine receptor CCR2 is decreased on circulating monocytes in sporadic amyotrophic lateral sclerosis (sALS). J Neuroimmunol. 2006:179;87-93. 112. Casula M, Iyer AM, Spliet WGM, Anink JJ, Steentjes K, Sta M, et al. Toll-like receptor signaling in amyotrophic lateral sclerosis spinal cord tissue.Neuroscience.2011:179;233-243. 113. Vance C, et al. Mutations in FUS, an RNA processing protein, cause familial Amyotrophic Lateral Sclerosis type 6. Science. 2009; 323 (5918): 1208-1211. 114. Kwaitkowski TJ, et al. Mutations in the FUS/TLS gene on chromosome 16 cause familial Amyotrophic Lateral Sclerosis. Science. 2009; 323 (5918). 1205-1208. 115. Huang C, et al. FUS transgenic rats develop the phenotypes of amyotrophic lateral sclerosis and frontotemporal lobar degeneration. PLoS Genet. 2011; 7 (3): e1002011. 116. Gene Home Reference. VCP. Available at: http://ghr.nlm.nih.gov/gene/VCP. Accessed January, 2012. 117. Johnson JO, et al. Exome sequencing reveals VCP mutations as a cause of familial ALS. Neuron. 2010; 68 (5): 857-864. 118. Piao Y, Hashimoto T, Takahama S, Kakita A, Komori T, Morita T, et al. Survival motor neuron (SMN) protein in the spinal anterior horn cells of patients with sporadic amyotrophic lateral sclerosis.Brain Res. 2011:1372;152-159. 119. Genetics Home Reference. Genes: SMN 1. Available at: http://ghr.nlm.nih.gov/gene/SMN1. Accessed: January 29,2012. 120. National Center for Biotechnology Information. GFAP glial fibrillary acidic protein [ Homo sapiens ]. Last reviewed January 29, 2012. Accessed January 29. 2012. 121. Yoshii Y, Otomo A, Pan Lei, Ohtsuka M, Hadano S. Loss of glial fibrillary acidic protein marginally accelerates disease progression in a SODAH46R transgenic mouse model of ALS. Neuroscience Research. 2011;70:321-329. 122. Rutherford NJ, et al. Novel mutations in TARDBP (TDP-43) in patients with familial amyotrophic lateral sclerosis. PLoS Genet. 2008; 4 (9): e1000193. 123. Liu-Yesucevitz L, et al. Tar DNA binding protein-43 (TDP-43) associates with stress granules: analysis of cultured cells and pathological brain tissue. PLoS one. 2010; 5 (10): e13250. 124. Wegorzewska I, Bell S, Cairns NJ, Miller TM, Baloh RH. TDP-43 mutant transgenic mice develop features of ALS and frontotemporal lobar degeneration. Proc Natl Acad Sci USA. 2009; 106 (44): 18809-18814. 125. Stallings NR, Puttaparthi K, Luther CM, Burns DK, Elliot JL. Progressive motor weakness in transgenic mice expressing human TDP-43. Neurobiol Dis. 2010; 40 (2): 404–414. 126. Liang H, Ward WF. PGC-1α: a key regulator of energy metabolism. Advan in Physiol Edu. 2006; 30 (4): 145-151. 127. Rona-Voros K, Weydt P. The Role of PGC-1alpha in the Pathogenesis of Neurodegenerative Disorders. Curr Drug Targets. 2010; 11 (10): 1262-1269. 128. Turner BJ, Parkinson NJ, Davies KE, Talbot K. Survival motor neuron deficiency enhances progression in an amyotrophic lateral sclerosis mouse model.Neurobiol Dis. 2009:34(3);511-517. 129. Sussmuth SD, Tumani H, Ecker D, Ludolph AC. Amyotrophic lateral sclerosis: disease stage related changes of tau protein and S100 beta to cerebrospinal fluid and creatine kinase.Neurosci Lett. 2003:353;57-60. 130. Shobha K, Alladi PA, Nalini A, Sathyaprabha TN, Raju TR. Exposure to CSF from sporadic amyotrophic lateral sclerosis patients induces morphological transformation of astroglia and enhances GFAP and S100beta expression.Neurosci Lett. 2010:473(1);56-61. 131. Lundy-Ekman L. Neuroscience Fundamental for Rehabilitation. 3rd edition. St. Louis, MO: Saunders Elsevier; 2007. 132. Rothstein JD. Current hypotheses for the underlying biology of amyotrophic lateral sclerosis. Ann Neurol. 2009;65 Suppl 1:S3-9. 133. Marszalek JR. Neurofilament subunit NF-H modulates axonal diameter by selectively slowing neurofilament transport. J Cell Biol. November 1996;135(3):711-724. 134. Fialova L et al. Cerebrospinal fluid and serum antibodies against neurofilaments in patients with amyotrophic lateral sclerosis. Eur J Neurol. 2010;17(4):562-566. 135. Meldrum BS. Glutamate as a neurotransmitter in the brain: review of physiology and pathology. J Nutr. 2000;130(4S Suppl):1007S-1015S. 136. Martin LJ, Chang Q. Inhibitory synaptic regulation of motoneurons: A new target of disease mechanisms in amyotrophic lateral sclerosis. Mol Neurobiol. 2012;45:30-42. 137. Gehrman J, Matsomoto Y, Kreutzberg GW. Microglia: intrinsic immunoeffector cell of the brain. Brain Res Rev 1995:20;269-87. 138. Henkel JS, Beers DR, Zhao W, Appel SH. Microglia in ALS: the good, the bad and the resting. J Neuroimmune Phrmacol 2009:4;289-98. 139. Beers DR, Zhao W, Appel SH. CD4+ T-cells support glial neuroprotection, slow disease progression and modify glial morpgology in an animal model of inherited ALS. Proc Natl Acad Sci USA 2008:105;15558-63. 140. Hensley K, Fedynyshyn J, Ferrell S, Floyd RA, Gordon B, Grammas P et al. Message and protein-level elevation of tumor necrosis factor alpha (TNFα) and TNFα-modulating cytokines in spinal cords of the G93A-SOD1 mouse model for amyotrophic lateral sclerosis. Neurobio Dis. 2003; 14:74-80. 141. IgG Subclass Deficiency. Immune Disease.com Information and Support for Primary Immunodeficiency (PI). http://www.immunedisease.com/about-pi/types-of-pi/igg-subclass-deficiency.html. Accessed January 31, 2012. 142. Position statement: Immune function and exercise. Exerc Immunol Rev. 2011;17:6-63. 143. Immunoglobulin G deficiency. Medscape Reference. http://emedicine.medscape.com/article/136897-overview. Accessed January 31, 2012. 144. Ehrenstein MR, Notley CA. The importance of natural IgM: Scavenger, protector and regulator. Nat Rev Immunol. 2010;10(11):778-786. 145. Kaspar Bk, Llado J, Sherkat N, Rothstein JD, Gage FH. Retrograde viral delivery of IGF-1 prolongs survival in a mouse ALS model. Science. 2003;201: 839-842. 146. Dodge JC, Haidet AM, Yany W, Passini MA, Hester M, Clarke J et al. Delivery of AAV-IGF-1 to the CNS extends survival in ALS mice through modification of aberrant glial cell activity. Mol Ther. 2008; 16(6):1056-1064. 148. Godfrey DI, MacDonald HR, Kronenberg M, Smyth MJ, Van Kraer L. NKT cells: what's in a name? Nat Rev Immunol 2004:4;231-37. 149. Verma A, Berger JR. ALS syndrome in patients with HIV-1 infection. J Neurol Sci 2006:240;59-64. 150. Basic information about HIV/AIDS. http://www.cdc.gov/hiv/topics/basic/index.htm. Reviewed August 3 2011. 151. MacGowan DJ, Seelsa SN, Waldron M. An ALS-like syndrome with new HIV infection and complete response to anti-retroviral drugs. Neurology 2001:57;1094-97. 152. Kawahara Y, Ito K, Sun H, Aizawa H, Kanazawa I, Kwak S. Glutamate receptors: RNA editing and death of motor neurons. Nature. 2004;427:801. 153. Hideyama T et al. Induced loss of ADAR2 engenders slow death of motor neurons from Q/R site-unedited GluR2. J Neurosci. 2010;30:11917-11925. 154. Gonatas NK, Stieber A, Gonatas JO. Fragmentation of the golgi apparatus in neurodegenerative diseases and cell death. J Neurol Sci 2006:246;21-30. 155. Nakagami S, Barsoum MJ, Bossy-Wetzel E, Sutterlin C, Malhotra V, Lipton SA. A golgi fragmentation pathway in neurodegeneration. Neurobiol Dis 2008:29;221-31. 156. Graves MC, Fiala M, Dinglasan LA, Liu NQ, Sayre J, Chiappell F et al. Inflammation in amyotrophic lateral sclerosis spinal cord and brain is mediated by activated macrophages, mast cells and T cells. ALS and other motor neuron disorders. 2004; 5: 1-7. 157. Lirk P, Hoffman G, Rieder J. Inducible nitric oxide synthase-time for reappraisal. Inflam and Allergy. 2002;1:89-108. 158. Lee J, Ryu H, Kowall NW. Differential regulation of neuronal and inducible nitric oxide synthase (NOS) int he spinal cord of mutant SOD1 (G93A) ALS mice. Biochem Biophys Red Commun. 2009; 387: 202-206. 159. Consilvio C, Vincent AM, Feldman EL. Neuroimflammation, COX-2 and ALS-dual role? Ex Neurol. 2004; 187: 1-10. 160. Almer G, Guegan C, Teismann P, Naini A, Rosoklija G, Hays A.P et al. Increased expression of the pro-inflam- matory enzyme cyclooxygenase-2 in amyotrophic lateral sclerosis. Ann. Neurol. 2001; 49: 176–185. 161. Grabrucker AM, Rowan M, Garner CC. Brain-delivery of zinc-ions as potential treatment for neurological diseases: mini review. Drug Deliv Lett. 2011;1(1):13-23. 162. Smith AP, Lee NM. Role of zinc in ALS. Amyotroph Lateral Scler. 2007;8(3):131-143. 163. Copper in Human Health. Copper Development Association. http://www.copper.org/consumers/health/papers/cu_health_uk/cu_health_uk.html. Accessed February 1, 2012. 164. Wong PC, Waggoner D, Subramaniam JR, et al. Copper chaperone for superoxide dismutase is essential to activate mammalian Cu/Zn super- oxide dismutase. Proc Natl Acad Sci U S A. 2000;97:2886-91. 165. Choi C, Lee YD, Gwag BJ, Cho SI, Kim SS, Suh-Kim H. Effects of estrogen on lifespan and motor functions in female hDOS1 G93A transgenic mice. J Neurol Sci. 2008;268:40-47. 166. Chio A, Bottacchi E, Buff a C, Mutani R, Mora G, PARALS. Positive effects of tertiary centres for amyotrophic lateral sclerosis on outcome and use of hospital facilities. J Neurol Neurosurg Psychiatry. 2006:77;948–50. 167. Van den Berg JP, Kalmijn S, Lindeman E, et al. Multidisciplinary ALS care improves quality of life in patients with ALS.Neurology. 2005:65;1264–67. 168. Chio A, Mora G, Balzarino C, Mutani R. Interdisciplinary ALS Centres: effect of survival and use of health services in a population-based survey. Neurology. 2004;62(Suppl 5):S23.003 (Abstract 268). 169. Radunovic A, Mitsumoto H, Leigh PN. Clinical care of patients with amyotrophic lateral sclerosis. Lancet Neurol.2007:6;913-925. 170. Andersen PM, Borasio GD, Dengler R, Hardiman O, Kollewe K, Leigh PN, et al. Good practice in the management of amyotrophic lateral sclerosis: Clinical guidelines. An evidence-based review with good practice points. EALSC working group.Amyotroph Lateral Scler.2007:8;195-213. 171. Mitchel JD, O’Brien MR, Joshi M. Audit of outcomes in motor neuron disease (MND) patients treated with riluzole.Amyotroph Lateral Scler. 2006:7;67–71. 172. Zoccolella S, Beghi E, Palagano G, et al. Riluzole and amyotrophic lateral sclerosis survival: a population-based study in southern Italy.Eur J Neurol.2007:14;262–68. 173. Miller RG, Mitchell JD, Lyon M, Moore DH. Riluzole for amyotrophic lateral sclerosis (ALS)/motor neuron disease (MND).Amyotroph Lateral Scler Other Motor Neuron Disord.2003:4;191–206. 174. Harvey RA, Champe PC. Pharmacology. Fourth Edition. Philadelphia,PA: Lippincott Williams & Wilkins; 2009. 175. Pugdahl K, Fuglsang-Frederiksen A, de Carvalho M, et al. Generalised sensory system abnormalities in amyotrophic lateral sclerosis: a European multicentre study.J Neurol Neurosurg Psychiatry. 2007:78;746–49. 176. Bourke SC, Tomlinson M, Williams TL, Bullock RE, Shaw PJ, Gibson GJ. Effects of non-invasive ventilation on survival and quality of life in patients with amyotrophic lateral sclerosis: a randomized controlled trial.Lancet Neurol.2006:5;140–147. 177. Cazzolli PA, Oppenheimer EA. Home mechanical ventilation for amyotrophic lateral sclerosis: nasal compared to tracheostomy intermittent positive pressure ventilation.J Neurol Sci.1996:139;123–28. 178. Desport JC, Preux PM, Troung TC, Vallat JM, Sauterau D, Couratier P. Nutritional status is a prognostic risk for survival in ALS patients.Neurology.1999:53;1059–63. 179. Desport JC, Preux PM, Truong CT, Courat L, Vallat JM, Couratier P. Nutritional assessment and survival in ALS patients.Amyotroph Lateral Scler Other Motor Neuron Disord.2000:1;91–96. The charts on your page look great and organizes the information really well! This page looks great! I think the information provided is very thorough, clearly explained, and well organized. It seems like you utilized a wide variety of current articles. I really like how you used a table to describe the cellular components associated with ALS and provided a description of normal function. I would agree with Liz that adding pictures may help break up the information and help visual learners gain a better understanding of the cellular pathways…I recommend searching for images from your articles using google image to make sure that they are in the public domain. This page is very thorough, easy to read, and seems to cover all pertinent points relevant to the disease on a level that is understandable but still in depth. I think you did a good job making sure the information in the chart as well as the pathogenesis of the disease is easy to read and follow. I'm sure this information did not read quite as easily in the sources you cited…:-D I know that a few others have suggested adding more pictures and I agree…specifically, I think pictures in the pathogenesis or cell components section would be helpful. Overall, great job! The last sentence in the first paragraph of the Apoptosis section contains a typo and is also hard to follow. Overall I think the page looks really good. This page is really good!! I like the use of charts and pictures to help explain the information. I think you clearly explained all the information. It's understandable, but still in depth enough for our audience. Great job!! I think the table of the cellular components of ALS is a good idea! Although it is large, it makes it very easy to note the differences with ALS. The page is very informative. You did a good job of discussing the research within the content of the page. I do agree with the above comments to include pictures in the pathogenesis section. Overall, this is a very well done page! I knew that ALS was complex, but I had no idea there was this much information. I can tell that you all spent a long time gathering the most up to date literature. I really liked the chart of the cellular components, especially how the title was repeated throughout to break up the chart. I also thought the glutamate picture was very helpful in understanding glutamate excitotoxicity. A few constructive comments: possibly break up some of the sections into more paragraphs (i.e. SOD1 and ALS, the mice sections, apoptosis) to make for an easier read, maybe add hyperlinks within your page like you did for zinc (i.e. SOD1, the El Escorial chart-I was wanting more information when I first read these in the beginning sections), possibly move the types of ALS under the definition of ALS (I feel like the definitions for the types provide a good segway into the more detailed risk factors, etc). Thanks Alyssa for the constructive comments. I think those suggestions will help with the flow of our page! Page looks great. Tables for cellular components and symptom management are excellent.